Welcome to the EPA's "Preliminary Remediation Goals for Radionuclide Contaminants at Superfund Sites" (PRG) user's guide. Here you will find descriptions, equations and default exposure parameters used to calculate the risk-based PRGs. Additional guidance is also provided on sources of parameters and proper PRG use. It is suggested that users read the PRG FAQ page before proceeding. The user guide is extensive so please use the "Open All Sections" and "Close All Sections" links below as needed. Individual sections can be opened and closed by clicking on the section titles. Before proceeding through the user's guide please read the Disclaimer. This guidance document sets forth EPA's recommended approaches based upon currently available information with respect to risk assessment for response actions at Comprehensive Environmental Response, Compensation, and Liability Act (CERCLA) sites (commonly known as Superfund). This document does not establish binding rules. Alternative approaches for risk assessment may be found to be more appropriate at specific sites (e.g., where site circumstances do not match the underlying assumptions, conditions and models of the guidance). The decision whether to use an alternative approach and a description of any such approach should be documented. Accordingly, when comments are received at individual sites questioning the use of the approaches recommended in this guidance, the comments should be considered and an explanation provided for the selected approach. The policies set out in the Radionuclide PRG User Guide provide guidance to EPA staff. It also provides guidance to the public and regulated community on how EPA intends the National Oil and Hazardous Substances Pollution Contingency Plan (NCP) be implemented. EPA may change this guidance in the future, as appropriate. It should also be noted that calculating a PRG addresses neither human radionuclide dose or noncancer toxicity, nor potential ecological risk. Of the radionuclides generally found, at CERCLA sites, only uranium has potentially significant noncancer toxicity. When assessing sites with uranium as a contaminant, it may also be necessary to consider the noncancer toxicity of uranium, using other tools, such as EPA's Regional Screening Levels (RSLs) for Chemical Contaminants at Superfund Sites electronic calculator for uranium in soil, water, and air, and the WTC for uranium inside buildings. EPA's SPRG Calculator should be used to assess radionuclide cancer risk for hard outside surfaces, and the BPRG Calculator for radionuclide cancer risk inside buildings. EPA's DCC Calculator should be used to assess radionuclide dose for soil, water, and air, BDCC Calculator for radionuclide dose inside buildings, and the SDCC Calculator for radionuclide dose for hard outside surfaces. Similarly, some sites with radiological contaminants in sensitive ecological settings may also need to be evaluated for potential ecological risk. EPA's guidance (Ecological Risk Assessment Guidance for Superfund: Process for Designing and Conducting Ecological Risk Assessment) contains an eight step process for using benchmarks for ecological effects in the remedy selection process. This web calculator may be used to develop generic PRGs for radionuclides for several different exposure scenarios. The calculator is flexible and may be used to derive site-specific PRGs as more site characterization is obtained (EPA 2000a). Models reviewed by EPA in the Soil Screening Guidance for Radionuclides: Technical Background Document are presented in Section 3-2. This report provides a detailed technical analysis of five unsaturated zone fate and transport models for radionuclides. This report supports the information provided in Part 3 - Unsaturated Zone Models for Radionuclide Fate and Transport [PDF 383KB, 25 pages] of the Soil Guidance for Radionuclides: Technical Background Document on determining the general applicability of the models to surface conditions, and an assessment of each model's potential applicability to the soil screening process. A purpose of this guidance is to provide a PRG calculation tool to assist risk assessors, remedial project managers, and others involved with risk assessment and decision-making at CERCLA sites in developing PRGs. This database is based on Risk Assessment Guidance for Superfund: Volume I, Human Health Evaluation Manual (Part B, Development of Risk-based Preliminary Remediation Goals) (RAGS Part B). RAGS Part B provides guidance on calculating risk-based PRGs. Initially used at the scoping phase of a project using readily available information, risk-based PRGs may be modified based on site-specific data gathered during the RI/FS study. PRG development and screening should assist staff in streamlining the consideration of remedial alternatives. Chemical-specific PRGs are from two general sources. These are: (1) concentrations based on potential Applicable or Relevant and Appropriate Requirements (ARARs) and (2) risk-based concentrations. ARARs include concentration limits set by other environmental regulations such as Safe Drinking Water Act maximum contaminant levels (MCLs). The second source for PRGs, and the focus of this database tool, is risk-based calculations that set concentration limits using carcinogenic toxicity values under specific exposure conditions. This database tool presents standardized risk-based PRGs and variable risk-based PRG calculation equations for radioactive contaminants. Ecological effects are not considered in the calculator for radionuclides PRGs. PRGs are presented for resident soil, outdoor worker soil, indoor worker soil, composite worker soil, recreator soil, farmer soil, construction worker soil, tap water, air, farm products and fish ingestion. The risk-based PRGs for radionuclides are based on the carcinogenicity of the contaminants. Cancer slope factors (SFs) used are provided by the Center for Radiation Protection Knowledge. The main report is Calculations of Slope Factors and Dose Coefficients and the tables of slope factors are in a separate appendix. Non-carcinogenic effects are not considered for radionuclide analytes, except for uranium for which both carcinogenic and non-carcinogenic effects are considered. To determine PRGs for the chemical toxicity of uranium, and for other chemicals, go to the Regional Screening Levels for Chemical Contaminants at Superfund Sites webpage. The standardized PRGs are based on default exposure parameters and incorporate exposure factors that present RME conditions. This database tool presents PRGs in both activity and mass units. Once this database tool is used to retrieve standard PRGs or calculate site-specific PRGs, it is important to clearly demonstrate the equations and exposure parameters used in the calculations. Discussion of the assumptions that go into the PRGs calculated should be included in the document where the PRGs are presented such as a Remedial Investigation (RI) Report or Feasibility Study. This website combines current Center for Radiation Protection Knowledge SFs with standard exposure factors to estimate contaminant concentrations in environmental media (biota, air, soil and water) that are protective of humans (including sensitive groups) over a lifetime. Sufficient knowledge about a given site may warrant the use of site-specific assumptions which may differ from the defaults. Exceeding a PRG usually suggests that further evaluation of the potential risks is appropriate. The PRG concentrations presented on this website can be used to screen pollutants in environmental media, trigger further investigation, and provide initial cleanup goals, if applicable. PRGs should be applied in accordance with guidance from EPA Regions. In addition to this guidance, for relevant training, see the internet-based course "Radiation Risk Assessment: Updates and Tools." PRGs are isotope concentrations that correspond to certain levels of risk from exposure to air, soil, water and biota. Slope Factors (SFs), for a given radionuclide represent the risk equivalent per unit intake (i.e. ingestion or inhalation) or external exposure of that radionuclide. In risk assessments these SFs are used in calculations with radionuclide concentrations and exposure assumptions to estimate risk from exposure to radioactive contamination. The calculations may be rearranged to generate PRGs for a specified level of risk. SFs may be specified for specific body organs or tissues of interest, or as a weighted sum of individual organ risk, termed the effective risk equivalent. These SFs may be multiplied by the total activity of each radionuclide inhaled or ingested per year, or the external exposure concentration to which a receptor may be exposed, to estimate the risk to the receptor. Slope Factors used are provided by the Center for Radiation Protection Knowledge. The main report is Calculations of Slope Factors and Dose Coefficients and the tables of DCFs are in a separate appendix. Inhalation slope factors are tabulated separately for each of the three lung absorption types considered in the lung model currently recommended by the International Commission on Radiological Protection (ICRP), and, where appropriate, for inhalation of radionuclides in vapor or gaseous forms. The designations "F", "M", and "S" presented in the Radionuclide Table under the heading "ICRP Lung Type" refer to the lung absorption type for inhaled particulate radionuclides, expressed as fast (F), medium (M), or slow (S), as used in the current ICRP model of the respiratory tract. The inhalation slope factor value tabulated in the Radionuclide Table for each radionuclide have been selected based on the following guidelines: (1) For those elements where Table 4.1 of Federal Guidance Report No. 13 (and Table 2 of ICRP Publication 72) specifies a recommended default lung absorption type for particulates, the inhalation slope factor for that type is tabulated in the Radionuclide Table for each radioisotope of that element. (2) For those elements where no specific lung absorption type is recommended and multiple types are indicated as plausible choices, the inhalation slope factor reported in the Radionuclide Table for each radioisotope of that element is the maximum of the values for each of the plausible lung absorption types. (3) Where Federal Guidance Report No. 13 specifies risk coefficients for multiple chemical forms of certain elements (tritium, carbon, sulfur, iodine, and mercury), the inhalation slope factor value for the form estimated to pose the maximum risk is reported in the Radionuclide Table in most cases. Inhaled particulates are assumed to have an activity median aerodynamic diameter (AMAD) of 1 um, as recommended by the ICRP for consideration of environmental exposures in the absence specific information physical characteristics of the aerosol. Where appropriate, radionuclides may be present in gas or vapor form, are designated by "G" and "V", respectively; such radionuclides include tritium, carbon, sulfur, nickel, ruthenium, iodine, tellurium, and mercury. 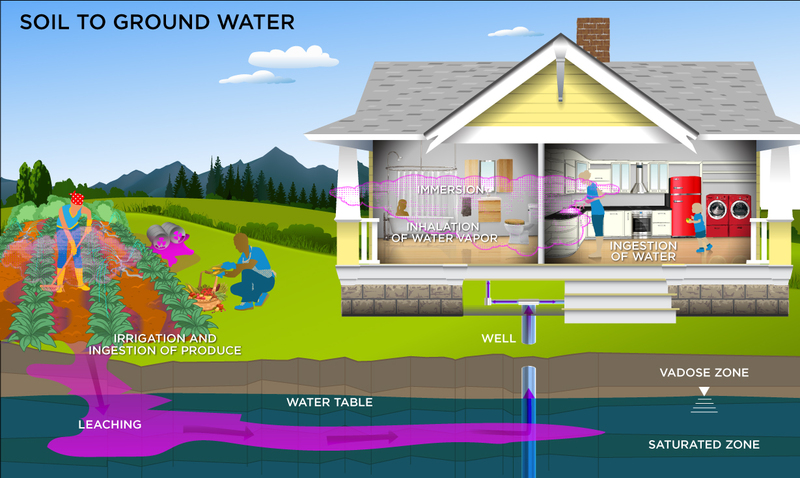 The most common land uses and exposure assumptions are included in the equations on this website: Resident Soil, Composite Worker Soil, Outdoor Worker Soil, Indoor Worker Soil, Construction worker Soil, Farmer Soil, Recreator Soil, resident Air, Composite Worker Air, Outdoor Worker Air, Indoor Worker Air, Construction worker Air, Farmer Air, Recreator Air, Tapwater, Soil to Groundwater and Ingestion of Fish. The PRGs are generated with standard exposure route equations using EPA SFs and exposure parameters. For the calculation of soil ingestion slope factors, area correction factors, and gamma shielding factors, a standard soil density of 1.6 g/cm3 has been used. The calculator offers three options for calculating PRGs. Previous versions of this calculator employed slope factors that included progeny ingrowth for 100 years; designated "+D." The +D slope factors are no longer included in the pick list. This section describes the potential applications of the three choices and recommends a default PRG calculation. This is the preferred PRG calculation option and is marked as the default selection in the calculator. When a single isotope is selected, the calculator identifies all the daughters in the chain. The PRGs for each daughter are combined with the parent on a fractional basis. The fractional basis is determined by branching fractions where a progeny may decay into more than one isotope. The resulting PRG is now based on secular equilibrium of the full chain. For straight chain decay, all the progeny would be at the same activity of the parent and the PRG provided in the output would be the inverse sum of the reciprocal PRGs of the parent and all the progeny. Currently, all the soil PRG equation images are presented with a radioactive decay term to account for half-lives shorter than the exposure duration. Decay is not included in this PRG option as the assumption of secular equilibrium is that the parent is continually being renewed. When the secular equilibrium PRG output option is selected, the PRG Calculator now gives the option to show the individual progeny contributions for the PRG (and risk) output. When the option to display progeny contribution is selected, the PRG Calculator output gives the secular equilibrium PRG and the individual progeny PRGs in separate tables. A total PRG is calculated using the following formula. This option displays the PRGs calculated with half-life decay as identified in the PRG equation images. In addition to the selected isotope, all the individual progeny PRGs are displayed. Each PRG is determined with each isotopes respective half-life and not that of its parent isotope. This option does not assume secular equilibrium and presents the progeny so that when screening environmental data against PRGs, the risk assessor can identify any isotopes for which he has no data. Users can alter progeny half-life to match the parent isotope or other progeny or to account for ingrowth and decay over a chain. This option displays PRGs, with half-life decay as identified in the PRG equation images, for only the selected isotopes. In this output, secular equilibrium is not assumed and no progeny PRGs are displayed or contribution combined into the PRG for the selected isotope. EPA classifies all radionuclides as Group A carcinogens ("carcinogenic to humans"). Group A classification is used only when there is sufficient evidence from epidemiologic studies to support a causal association between exposure to the agents and cancer. The appendix radionuclide table, from the Center for Radiation Protection Knowledge, lists ingestion, inhalation and external exposure cancer slope factors (risk coefficients for total cancer morbidity) for radionuclides in conventional units of picocuries (pCi). Ingestion and inhalation slope factors are central estimates in a linear model of the age-averaged, lifetime attributable radiation cancer incidence (fatal and nonfatal cancer) risk per unit of activity inhaled or ingested, expressed as risk/pCi. 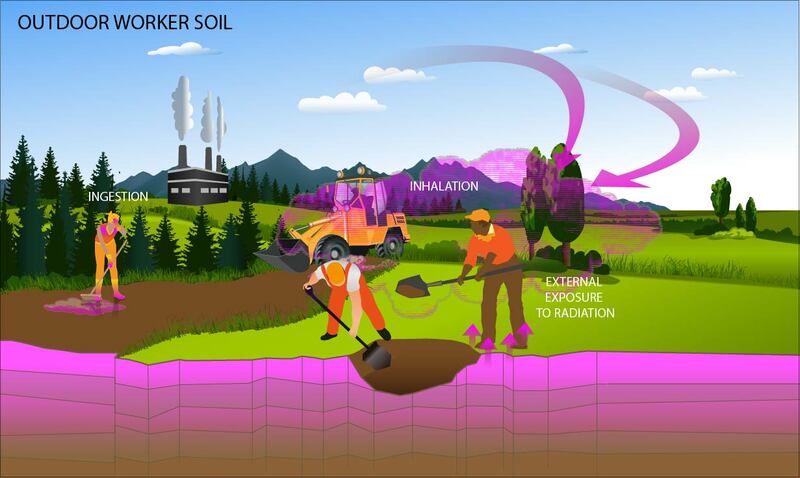 External exposure slope factors are central estimates of lifetime attributable radiation cancer incidence risk for each year of exposure to external radiation from photon-emitting radionuclides distributed uniformly in a thick layer of soil, and are expressed as risk/yr per pCi/gram soil. External exposure slope factors can also be used which have units of risk/yr per pCi/cm2 soil. When combined with site-specific media concentration data and appropriate exposure assumptions, slope factors can be used to estimate lifetime cancer risks to members of the general population due to radionuclide exposures. EPA currently provides guidance on inhalation risk assessment in RAGS Part F (Risk Assessment Guidance for Superfund Volume I: Human Health Evaluation Manual (Part F, Supplemental Guidance for Inhalation Risk Assessment). This guidance only addresses chemicals. The development of inhalation slope factors for radionuclides differs from the guidance presented in RAGS Part F for development of inhalation unit risk (IUR) values for chemicals. The SFs from the Center for Radiation Protection Knowledge differ from the values presented in HEAST. The SFs were calculated using ORNL's DCAL software in the manner of Federal Guidance Report 12 and 13. For the calculation of soil ingestion slope factors, a standard soil density of 1.6 g/cm3 has been used. The radionuclides presented are those provided in the International Commission on Radiological Protection (ICRP) Publication 107. This document contains a revised database of nuclear decay data (energies and intensities of emitted radiations, physical half-lives and decay modes) for 1,252 naturally occurring and man-made radionuclides. ICRP Publication 107 supersedes the previous database, ICRP Publication 38 published in 1983. Most dose and risk coefficients are presented for radionuclides in their ground state. In the decay process, the newly formed nucleus may be in an excited state and emit radiation; e.g., gamma rays, to lose the energy of the state. The excited nucleus is said to be in a metastable state which is denoted by the chemical symbol and atomic number appended by "m"; e.g., Ba-137m. If additional higher energy metastable states are present then "n", "p", ... is appended. Metastable states have different physical half-lives and emit different radiations and thus unique dose and risk coefficients. In decay data tabulations of ICRP 107), if the half-life of a metastable state was less than 1 minute then the radiations emitted in de-excitation are included with those of the parent radionuclide. Click to see a graphical representation of the decay of Cs-137 to Ba-137. Eu-152, in addition to its ground state has two metastable states: Eu-152m and Eu-152n. The half-lives of Eu-152, Eu-152m and Eu-152n are: 13.5 y, 9.31 m and 96 m, respectively and the energy emitted per decay is 1.30 MeV, 0.080 MeV, and 0.14 MeV, respectively. Several radionuclide-specific parameters are needed for development of the PRGs. The parameters are selected from a hierarchy of sources. Many sources are used to populate the database of radionuclide-specific parameters. They are briefly described below. IAEA TRS 472 (IAEA). Handbook of Parameter Values for the Prediction of Radionuclide Transfer in Terrestrial and Freshwater Environments. Technical Reports Series No. 472. International Atomic Energy Agency, Vienna. 2010. (IAEA TRS 364. Handbook of Parameter Values for the Prediction of Radionuclide Transfer in Temperate Environments (Technical Reports Series No. 364), 1994 was used to supplement egg, poultry and swine transfer factors.) Spreadsheet of values. Environment Agency (EA). Initial radiological assessment methodology - part 2 methods and input data. Spreadsheet of values. NCRP 123 (NCRP). NCRP Report No. 123, Screening Models for Releases of Radionuclides to the Atmosphere, Surface Water, and Ground. National Council on Radiation Protection and Measurements. January 22, 1996. Spreadsheet of values. EPA Radionuclide Soil Screening Level (SSL). Soil Screening Guidance for Radionuclides: User's Guide. Office of Solid Waste and Emergency Response (OSWER) Directive 9355.4-16A. October 2000. Spreadsheet of values. RESRAD. User's Manual for RESRAD Version 6. Environmental Assessment Division, Argonne National Laboratory. July 2001. Spreadsheet of values. BAES. A Review and Analysis of Parameters for Assessing Transport of Environmentally Released Radionuclides through Agriculture. C. F. Baes III, R. D. Sharp, A. L. Sjoreen, R.W. Shor. Oak Ridge National Laboratory 1984. Spreadsheet of values. ICRP 107. Nuclear Decay Data for Dosimetric Calculations. International Commission on Radiological Protection Publication 107. Ann. ICRP 38 (3), 2008. EPAKD. Understanding Variation in Partition Coefficient, Kd, Values. Volume II: Review of Geochemistry and Available Kd Values for Cadmium, Cesium, Chromium, Lead, Plutonium, Radon, Strontium, Thorium, Tritium (3H), and Uranium. Office of Air and Radiation. EPA 402-R-99-004B. August 1999. and Volume III: Review of Geochemistry and Available Kd Values for Americium, Arsenic, Curium, Iodine, Neptunium, Radium, and Technetium. Office of Air and Radiation. EPA 402-R-04-002C. July 2004. Spreadsheet of values. Generally the hierarchies below are followed. Half-life (yr), Decay mode, Atomic weight, Atomic number and Decay energy. ICRP 107. Milk transfer factor (TFdairy (day/L). IAEA, EA, NCRP, RESRAD. TFdairy is the volumetric activity density in milk (pCi/L) divided by the daily intake of radionuclide (pCi/day). Beef transfer factor (TFbeef (day/kg). IAEA, EA, NCRP, RESRAD. TFbeef is the mass activity density in beef (pCi/kg fresh weight) divided by the daily intake of radionuclide (in pCi/d). Fish bioconcentration factor (BCF (L/kg). IAEA, RESRAD. BCF is the ratio of the radionuclide concentration in the fish tissue (pCi/kg fresh weight) from all exposure pathways relative to that in water (pCi/L). Poultry transfer factor (TFpoultry (day/kg). IAEA. TFpoultry is the mass activity density in poultry (pCi/kg fresh weight) divided by the daily intake of radionuclide (in pCi/d). Egg transfer factor (TFegg (day/kg). IAEA. TFegg is the mass activity density in egg (pCi/kg fresh weight) divided by the daily intake of radionuclide (in pCi/d). Swine transfer factor (TFswine (day/kg). IAEA. TFswine is the mass activity density in swine (pCi/kg fresh weight) divided by the daily intake of radionuclide (in pCi/d). Sheep Milk transfer factor (TFsheep-milk (day/L). IAEA. TFsheep-milk is the volumetric activity density in sheep milk (pCi/L) divided by the daily intake of radionuclide (pCi/day). Sheep transfer factor (TFsheep (day/kg). IAEA, EA. TFsheep is the mass activity density in sheep (pCi/kg fresh weight) divided by the daily intake of radionuclide (in pCi/d). Goat Milk transfer factor (TFgoat-milk (day/L). IAEA. TFgoat-milk is the volumetric activity density in goat milk (pCi/L) divided by the daily intake of radionuclide (pCi/day). Goat transfer factor (TFgoat (day/kg). IAEA. TFgoat is the mass activity density in goat (pCi/kg fresh weight) divided by the daily intake of radionuclide (in pCi/d). Soil to water partition coefficient (Kd (mg/kg-soil per mg/L water or simplified = L/kg). EPAKD, IAEA, SSL, RESRAD, BAES. (Kd is the ratio of the mass activity density (pCi/kg) of the specified solid phase (usually on a dry mass basis) to the volumetric activity density (Bq/L) of the specified liquid phase. Soil to plant transfer factor-wet (Bvwet (pCi/g plant per pCi/g soil). IAEA, EA, NCRP, SSL, RESRAD, BAES. The values for cereal grain are used from IAEA. (Bvwet is the ratio of the activity concentration of radionuclide in the plant (pCi/kg wet mass) to that in the soil (pCi/kg dry mass). Note: Some Bvwet values were derived from Bvdry sources, assuming the ratio of dry mass to fresh mass was presented in the source documents. For carbon, the only value in the hierarchy is found in RESRAD. This value is excluded as it over estimates root uptake. See section 2.5.4 for a detailed discussion of the carbon transfer factor derivation. Soil to plant transfer factor-dry (Bvdry (pCi/g plant per pCi/g soil). IAEA, EA, NCRP, SSL, RESRAD, BAES. The values for cereal grain are used. (Bvdry is the ratio of the activity concentration of radionuclide in the plant (pCi/kg dry mass) to that in the soil (pCi/kg dry mass). Note: Some Bvdry values were derived from Bvwet sources, assuming the ratio of dry mass to fresh mass was presented in the source documents. Bvwet and Bvdry can be determined using the following equations. There are 22 individually calculated PRGs that make up the default produce PRG. Each individual PRG is determine based on produce specific data such as intake rate, soil to plant transfer factors (Bvwet), and soil mass loading factor (MLF). These 22 individual PRGs are then summed by inverse reciprocal to determine a total produce PRG. The MLFs and intake rates used in the determination of the default biota PRGs are based on fresh weight. Intake rates, MLFs, and tranfer factors were updated in July 2016. A pdf of the Technical Memorandum, released for this update, can be found here. This file is engineered for 2 sided printing. Table 2.4.1-A provides all of the default produce intake rates that are used to determine the total produce PRG. The delineation of (FW) in the column header indicates that the intake rates are for fresh weight, these are the intake rates used when the tool is run in default mode. In site-specific mode, the user may choose between Fresh Weight (FW) or Cooked Weight (CPW), which takes cooking and prepartion loss into account. In addition, the user may also add rice and cereal grain to the produce output. These intake rates can be found in Table 2.4.1-B below and are only given in dry weight (DW). In user-provided mode, the user may change produce specific and element specific parameters to model produce that is not provided in our tool, such as soil to plant transfer factor, mass loading factor, contaminated fraction, and intake rates. Another source for intake rates is the Food Commodity Intake Database (FCID). If the FCID is used, the user must convert the data to g/day, as it is required for use in this tool. In addition, a local food survey can be conducted. Much of the methodology in the Guidance for Conducting Fish and Wildlife Consumption Surveys may be useful for surveying produce consumption. To determine which produce are commonly cultivated in the area around the site, users should contact their county extension office. The National Pesticide Information Center has an interactive map that allows users to choose their state and county; then connects them to their county extension office. The new soil to plant transfer factors (Bvwet) from IAEA (TRS-472) are unique to climate zone, soil type, and produce type. There are three climate zones (Temperate, Tropical, and Subtropical), seven soil types (Default, Sand, Loam, Clay, Organic, Coral Sand, and Other), and 24 produce types implemented in the PRG calculator. When the tool is run in default mode, the climate zone is temperate, the soil type is Default, which applies to all soil types, and 22 produce are used. Corn and rice are not used in default mode because the parameters used for these are based on dry weight whereas the other 22 produce are based on fresh weight. For rice, IAEA did not specify a particular climate zone and, therefore, the rice transfer factors have been applied to all three climate zones. The following map shows how the climate zones are distributed across the United States. *The Holdridge life zones of the conterminous United States in relation to ecosystem mapping. Journal of Biogeography, 26, 1032. Table 2 below describes the soil classification used in TRS-472. The Coral Sand and Other soil types are not listed in Table 2. The 'Other' soil type classification, in a temperate climate, was created for soils without characterization data, and for mineral soils with unknown sand and clay contents (TRS-472 pg. 9). For tropical climates, the 'Coral Sand' soil type classification was changed from 'Other', given in TRS-472, because it refers to soils that are outside the classification scheme used here, such as Marshall Island soils, classified by the authors as coral sand soil (TRS-472 pg. 73). *Technical Report Series no. 472. The following table illustrates which soil to plant transfer factor categories from IAEA are used for each produce type in the PRG calculator. The individual produce output only lists the category name from IAEA, however, a value from a secondary source may be being utilized. While included in the initial hierarchy analysis, RESRAD and BAES sources do not contribute to our current output. They are retained in the user guide for informational purposes. Please click on flow chart to view a larger image. Carbon is missing from this chart. Please see section 2.5.4 of this user guide for information about how a soil to plant transfer factor was derived for Carbon in the PRG calculator. In default mode, the (FW) intake rates from Table 2.4.2-A are used. Similar to produce, there is an option to select Cooked Weight in site-specific mode. The intake rates for poultry include chicken, turkey, and duck. In default mode, the parameters used for poultry and eggs are for chicken specifically (i.e. Qp etc.). If eggs and poultry is selected in site specific mode, the user will have the option to switch between chicken, turkey, duck, and goose which will change the previously mentioned respective parameters, however the transfer factor used will still be meant for chicken or duck per TRS-472. If the user has a specific tranfer factor for turkey or goose, then user-provided mode should be used. Site-specific mode will also offer the user the option to add animal products from Table 2.4.2-B to the output. The tool has transfer factors for these products, however, the user will need to enter their own intake rate data as the tool does not provide any. Again, the Food Commodity Intake Database (FCID) may be used to find intake rate data but the user must convert the data to g/day, as it is required for use in this tool. While included in the initial hierarchy analysis, RADSSL and BAES sources do not contribute to our current output. They are retained in the user guide for informational purposes. Please click on flow chart to view a larger image. A mass loading factor (MLF) is the amount, or mass, of soil that adheres to the plant surface. The following table lists the MLFs used in this tool according to plant type. For more information on how these were derived please see the Technical Memorandum: Biota Modeling in EPA's Preliminary Remediation Goal and Dose Compliance Concentration Calculators for Use in EPA Superfund Risk Assessment: Explanation of Intake Rate Derivation, Transfer Factor Compilation, and Mass Loading Factor Sources. This file is engineered for 2 sided printing. The value of 5.5 given in Table D.3 of the RESRAD User's Manual for carbon root uptake was derived from data in Ng et al 1968. Table 4 of Ng 1968 presents a carbon composition in typical agricultural soil of 2.00E+04 ppm and a carbon composition in terrestrial plants of 1.10E+05 ppm in Table 10A. 1.10E+05 divided by 2.00E+004 gives the value of 5.5 reported in RESRAD. This value assumes that all the carbon in the plant is taken up by the roots; however, this is not the case. Photosynthesis is the primary source of carbon in plants. Carbon may be present in gas form in soils and volatilize into the plant canopy where it may be taken up by the plant in some fraction depending on atmospheric conditions. It is typically estimated 2% of plant carbon comes from soil (either directly or by uptake from the sub-canopy atmosphere). The other 98% of plant carbon comes from the above-canopy atmosphere, which is assumed not to contain carbon from the contaminated site. Consider that a plant is about 90% water and of the 10% dry matter about 40% is carbon. Therefore, plants comprise about 4% carbon on a fresh weight basis. A mineral soil is typically about 2% to 5% organic matter, which corresponds to 0.8% to 2% carbon on a dry mass basis. Thus, taking the ratio of carbon contents results in a transfer factor of 4%/(0.8% to 2%) = 5.0 to 2.0 g fresh plant/g dry soil. The next step is to apply the 2% fraction of plant carbon derived from soil. The resulting range of transfer factors is 0.1 to 0.04; (2%*(5.0 to 2.0)). The value of 0.1 is chosen for the calculation of PRGs and is used for all the BVwet values. BVdry values are derived for each plant type based on individual moisture content. For comparison purposes, the 5.5 value from RESRAD gives a transfer factor of 0.11 if the 2% assumption is made. The above derivation assumes that all the carbon taken up by the plant is radioactive. In situations where radioactive carbon is mixing with stable carbon, a site-specific transfer factor can be derived using a model called, "specific activity". Essentially, specific activity is the concentration ratio of the radioactive form to the stable form of carbon. Specific activity assumes, that within a compartment (i.e. soil), the radioactive contaminant mixes with the stable form both chemically and physically. Plants uptake the element in the same ratio as it exists in the soil compartment, resulting in the same ratio in the plant as in the soil compartment. To determine a site-specific soil to plant transfer factor, actual site data must be available. Further, the flux rate of the element must be in a steady-state condition. The environmental compartments must be well defined and the fluxes between compartments well understood. For further information, refer to the following: AMEC/004041/007 section 5, ANL/EAD-4 Appendix L, and IAEA TECDOC 1616 page 550. This PRG calculator focuses on the application of generic and simple site-specific approaches that are part of a larger framework for calculating concentration levels for complying with risk-based criteria. Generic PRGs for a 1 × 10-6 cancer risk standard are provided by viewing either the tables in the PRG Download Area section of this calculator or by running the PRG Calculator section of this website with the "Defaults" option. Part 3 of the Soil Screening Guidance for Radionuclides: Technical Background Document provides more information about 5 more detailed soil to groundwater models that are part of the same framework. Generic PRGs are calculated from the same equations presented in the site-specific portion of the calculator, but are based on a number of default assumptions chosen to be protective of human health for most site conditions. Generic PRGs can be used in place of site-specific PRG levels; however, in general, they are expected to be more protective than site-specific levels. The site manager should weigh the cost of collecting the data necessary to develop site-specific PRGs with the potential for deriving a higher PRG that provides an appropriate level of protection. The framework presented in Part 3 of the Soil Screening Guidance for Radionuclides: Technical Background Document includes more detailed modeling approaches that take into account more complex site conditions than the generic or simple site-specific methodology used for the soil to groundwater scenario in this calculator. More detailed approaches may be appropriate when site conditions (e.g., very deep water table, very thick uncontaminated unsaturated zone, soils underlain by karst or fractured rock aquifers) are substantially different than those assumed in the generic or simple-site methodology presented in this calculator. Further information on using more detailed approaches may be found in "Simulating Radionuclide Fate and Transport in the Unsaturated Zone: Evaluation and Sensitivity Analyses of Select Computer Models". This report provides a detailed technical analysis of five unsaturated zone fate and transport models for radionuclides. To avoid unnecessary inconsistency between radiological and chemical risk assessment and radiological dose assessment at the same site, users should generally use the same model for chemical and radionuclide risk assessment and radionuclide dose assessment. If there is a reason on a site-specific basis for using another model justification for doing so should be developed. The justification should include specific supporting data and information in the administrative record. The justification normally would include the model runs using both the recommended EPA PRG model and the alternative model. Users are cautioned that they should have a thorough understanding of both the PRG recommended model and any alternative model when evaluating whether a different approach is appropriate. When alternative models are used, the user should adjust the default input parameters to be as close as possible to the PRG inputs, which may be difficult since models tend to use different definitions for parameters. Numerous computerized mathematical models have been developed by EPA and other organizations to predict the fate and transport of radionuclides in the environment; these models include single-media unsaturated zone models (for example, groundwater transport) as well as multi-media models. These models have been designed for a variety of goals, objectives, and applications; as such, no single model may be appropriate for all site-specific conditions. Generally, even when a different model is used to predict fate and transport of radionuclides through different media, EPA recommends using the PRG calculators for the remedial program to establish the risk-based concentrations to ensure consistency with CERCLA, the NCP and EPA's Superfund guidance for remedial sites. Prior to using another model for risk assessment at a CERCLA remedial site, EPA regional staff, should consult with the Superfund remedial program's National Radiation Expert (Stuart Walker, at (703) 603-8748 or walker.stuart@epa.gov. For more information on issue, please see questions 10 and 16 on pages 12 and 17 to 18 of Radiation Risk Assessment At CERCLA Sites: Q & A (EPA 540-R-012-13, May 2014). The PRG calculator provides an option to select risk output. In the calculator, select yes if risk output is desired. Selecting risk output requires the calculator to be run in "Site Specific" mode. The "Soil to Groundwater" medium does not have risk output and the risk option will become disabled when selected. The risk values presented on this site are radionuclide-specific values for individual contaminants in air, water, soil and biota that may warrant further investigation or site cleanup. This portion of the risk assessment process is generally referred to as "Risk Characterization". This step incorporates the outcome of the exposure and toxicity assessments to calculate the risk resulting from potential exposure to radionuclides via the pathways and routes of exposure determined appropriate for the source area. The risk results are color coded to identify risk ranges and potential radionuclides of concern. The colors and the associated risk ranges are presented in the table below. The risk output is dependent on the PRG calculated as presented in the previous section. There are three calculator output options available to the user. The first option assumes secular equilibrium, the second and third options do not. If the second output option "Does not assume secular equilibrium, provide results for progeny throughout chain (with decay)" is selected with risk, the media concentrations for the progeny are automatically populated with the concentration entered for the parent. This autofill feature is not available when isotope chains overlap. The autofill feature is solely for convenience and does not assume secular equilibrium. If the data is collected from a site where secular equilibrium is assumed to be present, the user need only enter the activity of the parent in the calculator and a representative risk of the parent and all progeny will be presented in the calculator output. In the case of non-secular equilibrium the current "state of the chain" may not be known or easily calculated. In the case of relatively fast decaying isotopes, significant decay or ingrowth of progeny may have occurred since the sample date. Further, determining future activity of the contaminants may be useful in planning for future release of a property. A Decay Chain Activity Projection Tool has been developed where the user can select an isotope, enter a length of time to allow decay and ingrowth, and enter the beginning activity of the parent. The results of this tool, pictured below, are the activities of the parent and progeny at the end of the decay and ingrowth of progeny time. These activities can be entered into the PRG calculator to calculate risk using the second and third PRG Output options. Risk from a single exposure route for a single radionuclide. Summation of single radionuclide risk (without one-hit rule applied to single radionuclide results) for multiple exposure routes (right of each row). Summation of risk (without one-hit rule applied to single radionuclide results) from a single exposure route for multiple radionuclides (bottom of each column). Summation of total risk (without one-hit rule applied to single radionuclide results or summations listed above) from multiple radionuclides across multiple exposure routes (bottom right hand cell). When using PRGs, the exposure pathways of concern and site conditions should match those taken into account by the screening levels. (Note, however, that future uses may not match current uses. Future uses of a site should be logical as conditions which might occur at the site in the future.) Thus, it is necessary to develop a conceptual site model (CSM) to identify likely contaminant source areas, exposure pathways, and potential receptors. This information can be used to determine the applicability of screening levels at the site and the need for additional information. The final CSM diagram represents linkages among contaminant sources, release mechanisms, exposure pathways, and routes and receptors based on historical information. It summarizes the understanding of the contamination problem. A separate CSM for ecological receptors can be useful. Part 2 and Attachment A of the Soil Screening Guidance for Radionuclides: Users Guide (EPA 2000a) contains the steps for developing a CSM. A conceptual site model for the land uses presented in this calculator is presented below. Are there potential ecological concerns? Is there potential for land use other than those listed in the PRG calculator (i.e. , resident and worker)? Are there other likely human exposure pathways that were not considered in development of the PRGs? Are there unusual site conditions (e.g. large areas of contamination, high fugitive dust levels, potential for indoor air contamination)? The PRGs may need to be adjusted to reflect the answers to these questions. Natural background radiation should be considered prior to applying PRGs as cleanup levels. Background and site-related levels of radiation will be addressed as they are for other contaminants at CERCLA sites, for further information see EPA's guidance "Role of Background in the CERCLA Cleanup Program", April 2002, (OSWER 9285.6-07P). It should be noted that certain ARARs specifically address how to factor background into cleanup levels. For example, some radiation ARAR levels are established as increments above background concentrations. In these circumstances, background should be addressed in the manner prescribed by the ARAR. Applying PRG levels to a site without adequately developing a conceptual site model that identifies relevant exposure pathways and exposure scenarios. Use of PRG levels as cleanup levels without verifying numbers with a health physicist/risk assessor. Use of outdated PRG levels tables that have been superseded by more recent publications. Not considering the effects from the presence of multiple isotopes. 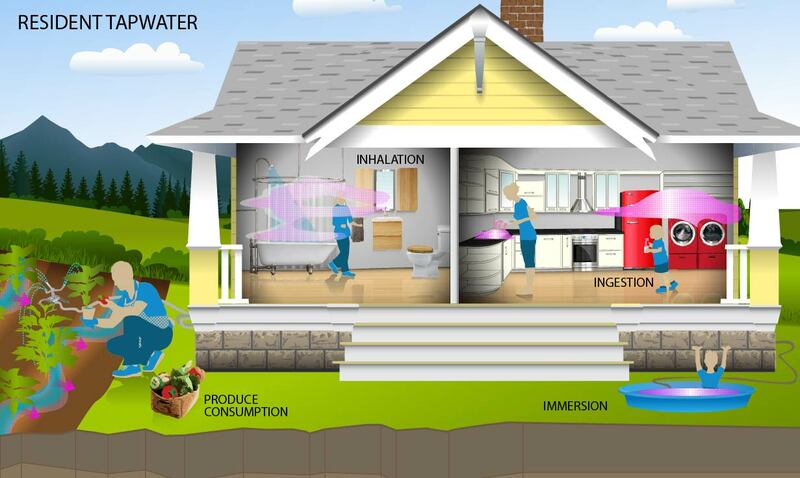 Not considering the individual model limitations as described in section 4 (e.g., inhalation of tapwater only considers C-14, H-3, Ra-224, Ra-226, Rn-220, and Rn-222). The PRGs consider human exposure to contaminated air, soils, water and biota. The equations and technical discussion are aimed at developing compliance levels for risk-based PRGs. The following text presents the land use equations and their exposure routes. Table 1 (at the end of the User's Guide) presents the definitions of the variables and their default values. The default values and exposure models are consistent with the Regional Screening Levels for Chemical Contaminants at Superfund Sites (RSL) calculator where the same pathways are addressed (e.g., ingestion and inhalation) and are analogous where pathways are similar (e.g., dermal and external exposure). This 2011 Exposure Factors Handbook. Any alternative values or assumptions used in remedy evaluation or selection on a CERCLA site should be presented with supporting rationale in Administrative Records. Risk Assessment Guidance for Superfund: Volume I, Human Health Evaluation Manual (Part B, Development of Risk-based Preliminary Remediation Goals) (RAGS Part B). U.S. EPA 2002. Supplemental Guidance for Developing Soil Screening Levels for Superfund Sites. OSWER 9355.4-24. December 2002. U.S. EPA 1994b. Radiation Site Cleanup Regulations: Technical Support Documents for the Development of Radiation Cleanup Levels for Soil - Review Draft. Office of Radiation and Indoor Air, Washington, DC. EPA 402-R-96-011A. PDF document View Appendix C here. U.S. EPA. 1994c. Revised Draft Guidance for Performing Screening Level Risk Analyses at Combustion Facilities Burning Hazardous Wastes. Attachment C. Office of Emergency and Remedial Response. Office of Solid Waste. December 14. U.S. EPA. 1998. Human Health Risk Assessment Protocol for Hazardous Waste Combustion Facilities. Office of Solid Waste, Washington, DC. EPA530-D-98-001A. A secure PDF can be downloaded here. NCRP 1996. Screening Models for Releases of Radionuclides to Atmosphere, Surface Water, and Ground, Vols. 1 and 2, NCRP Report No. 123. National Council on Radiation Protection and Measurements. 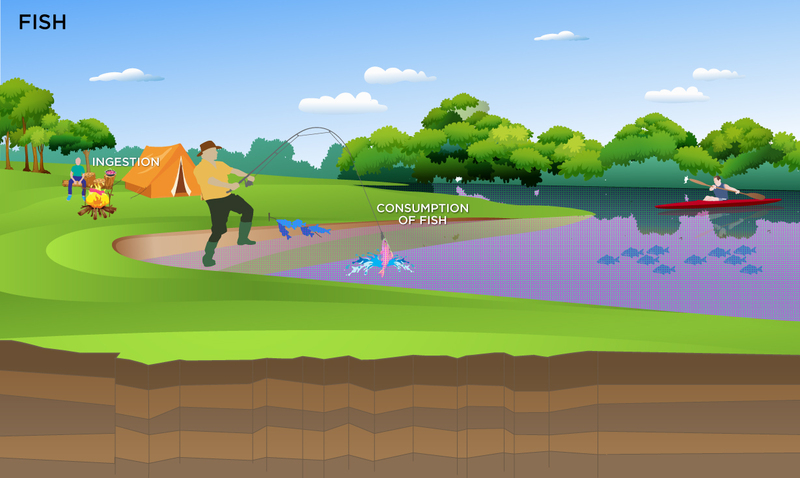 Users should note that if a route of exposure (e.g., ingesting fish from the pond in the farmer soil exposure scenario) is considered to be unreasonable at their site, both currently and in the future, they may eliminate the route in the site-specific option by entering zero for the ingestion rate of that route (e.g., replacing default fish ingestion rates in farmer soil scenario of 156.6 and 32.8 g/day with 0.0). This receptor spends most, if not all, of the day at home except for the hours spent at work. The activities for this receptor involve typical home making chores (cooking, cleaning and laundering) as well as gardening. The resident is assumed to be exposed to contaminants via the following pathways: incidental ingestion of soil, external radiation from contaminants in soil, inhalation of fugitive dust and consumption of home grown produce (100% of fruit and vegetables). Adults and children exhibit different ingestion rates for soil and produce. For example the child resident is assumed to ingest 200 mg per day while the adult ingests 100 mg per day. To take into account the different intake rate for children and adults, age adjusted intake equations were developed to account for changes in intake as the receptor ages. consumption of produce (fruits and vegetables) - back-calculated to soil. Sections 9 and 13 of the 2011 Exposure Factors Handbook were used to derive the intakes for home-grown produce. The consumption of produce exposure route drives the PRGs lower than all the other routes. It is recommended that produce-specific transfer factors (Bvwet) be used when available for a site. Further, the default transfer factors (Bvwet) from IAEA, used in these PRG calculations, are based on a composite of all soil groups. Transfer factors (Bvwet) for sand, loam, clay, organic, coral sand, and other soil types that may be more suited to a particular site are also provided. The site-specific option of the calculator can be used to focus on ingestion of individual produce types. When "Site-specific" is selected, if the user changes the "Select Isotope Info Type" to "User-provided", then a specific transfer factor may be changed. A number of studies have shown that inadvertent ingestion of soil is common among children 6 years old and younger (Calabrese et al. 1989, Davis et al. 1990, Van Wijnen et al. 1990). Therefore, the dose method uses an age-adjusted soil ingestion factor that takes into account the difference in daily soil ingestion rates, body weights, and exposure duration for children from 1 to 6 years old and others from 7 to 26 years old. The equation is presented below. 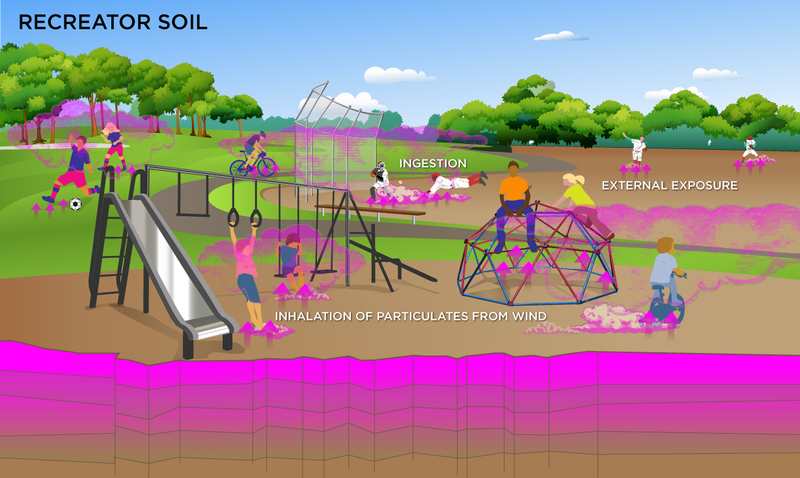 This health-protective approach is chosen to take into account the higher daily rates of soil ingestion in children as well as the longer duration of exposure that is anticipated for a long-term resident. For more on this method, see RAGS Part B. Age adjusted intake factors are also used for inhalation of particulates emitted from soil, and consumption of produce. These equations are also presented in the above equations. Definitions of the input variables are in Table 1. This receptor spends most, if not all, of the day at home except for the hours spent at work. The activities for this receptor involve typical home making chores (cooking, cleaning and laundering) as well as gardening. This analysis is designed to look at external exposure from contamination of different area sizes. Areas considered are 1 to 1,000,000 square meters. Isotope-specific area correction factor (ACF) were developed for this analysis. The resulting units for this recommended PRG are in pCi/g. The units are based on mass because the SF used is the soil volume for external exposure. The resulting units for this recommended PRG are in pCi/g. The units are based on mass because the SF used is the 1cm soil volume for external exposure. The resulting units for this recommended PRG are in pCi/g. The units are based on mass because the SF used is the 5cm soil volume for external exposure. The resulting units for this recommended PRG are in pCi/g. The units are based on mass because the SF used is the 15cm soil volume for external exposure. The resulting units for this recommended PRG are in pCi/cm2. The units are based on area because the SF used is the ground plane for external exposure. This receptor spends most, if not all, of the day at home except for the hours spent at work. The activities for this receptor involve typical home making chores (cooking, cleaning and laundering) as well as gardening. The resident is assumed to be exposed to contaminants via the following pathways: inhalation of ambient air and external radiation from contaminants in ambient air. To take into account the different inhalation rates for children and adults, age-adjusted intake equations were developed to account for changes in intake as the receptor ages. In situations where the contaminant in the air is not being replenished (e.g., an accidental one-time air release from a factory), decay should be used. In situations where the contaminant in the air has a continual source (e.g., indoor radon from radium in the soil, or an operating factory or landfill cap), the equations without decay should be used. The decay function, found in section 4.10.8, can be multiplied by the ambient air equations above to acquire ambient air PRGs with decay. This receptor is exposed to radionuclides that are delivered into a residence. Ingestion of drinking water is an appropriate pathway for all radionuclides. Activities such as showering, laundering, and dish washing also contribute to inhalation. The inhalation exposure route is only calculated for C-14, H-3, Ra-224, Ra-226, Rn-220, and Rn-222 which volatilize. External exposure to immersion in tapwater and exposure to produce irrigated with contaminated tapwater are also considered. 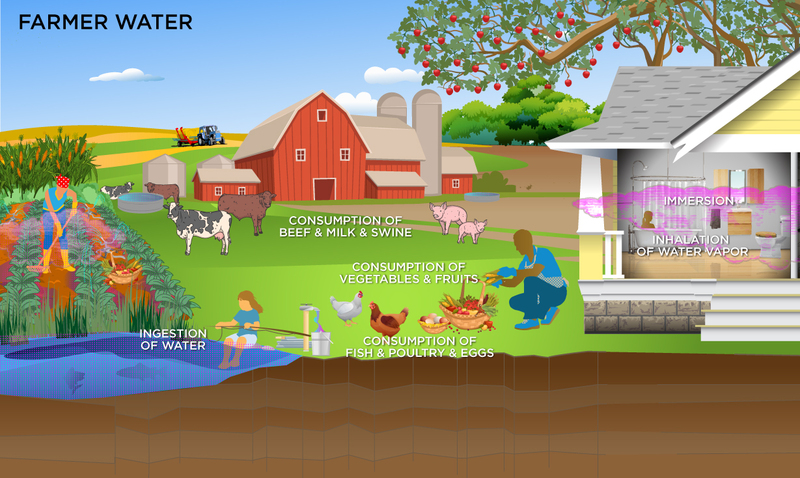 consumption of produce (fruits and vegetables) - back-calculated to tapwater, Sections 9 and 13 of the 2011 Exposure Factors Handbook were used to derive the intakes for home-grown produce. This is a long-term receptor exposed during the work day who is a full time employee working on-site and who spends most of the workday conducting maintenance activities outdoors. The activities for this receptor (e.g., moderate digging, landscaping) typically involve on-site exposures to surface soils. The composite worker is expected to have an elevated soil ingestion rate (100 mg per day) and is assumed to be exposed to contaminants via the following pathways: incidental ingestion of soil, external radiation from contaminants in soil, inhalation of fugitive dust . The composite worker combines the most protective exposure assumptions of the outdoor and indoor workers. The only difference between the outdoor worker and the composite worker is that the composite worker uses the more protective exposure frequency of 250 days/year from the indoor worker scenario. This land use is for developing industrial default screening levels that are presented in the Download Area. This is a long-term receptor exposed during the work day who is a full time employee working on-site and who spends most of the workday conducting maintenance activities outdoors. The activities for this receptor (e.g., moderate digging, landscaping) typically involve on-site exposures to surface soils. This is a long-term receptor exposed during the work day who is a full time employee working on-site and who spends most of the workday conducting maintenance activities outdoors. The activities for this receptor (e.g., moderate digging, landscaping) typically involve on-site exposures to surface soils. The composite worker is assumed to be exposed to contaminants via the following pathways: inhalation of ambient air and external radiation from contaminants in ambient air. The composite worker combines the most protective exposure assumptions of the outdoor and indoor workers. The only difference between the outdoor worker and the composite worker is that the composite worker uses the more protective exposure frequency of 250 days/year from the indoor worker scenario. This is a long-term receptor exposed during the work day who is a full time employee working on-site and who spends most of the workday conducting maintenance activities outdoors. The activities for this receptor (e.g., moderate digging, landscaping) typically involve on-site exposures to surface soils. 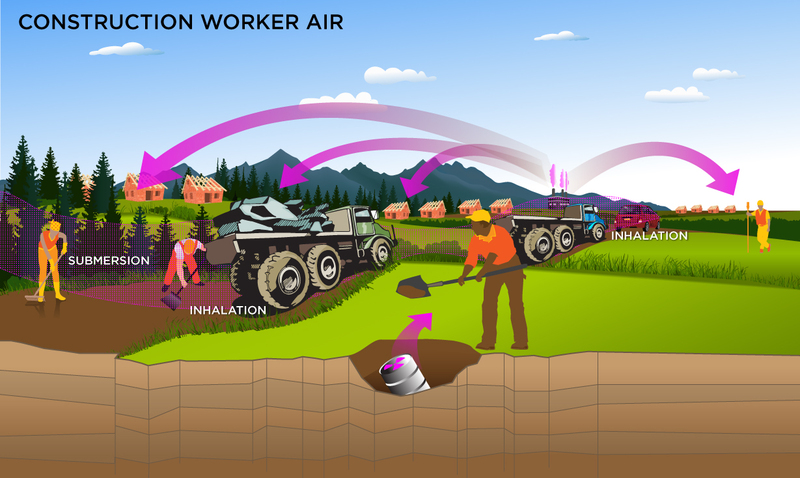 The outdoor worker is expected to have an elevated soil ingestion rate (100 mg per day) and is assumed to be exposed to contaminants via the following pathways: incidental ingestion of soil, external radiation from contaminants in soil, inhalation of fugitive dust. The outdoor worker receives more exposure than the indoor worker under commercial/industrial conditions. 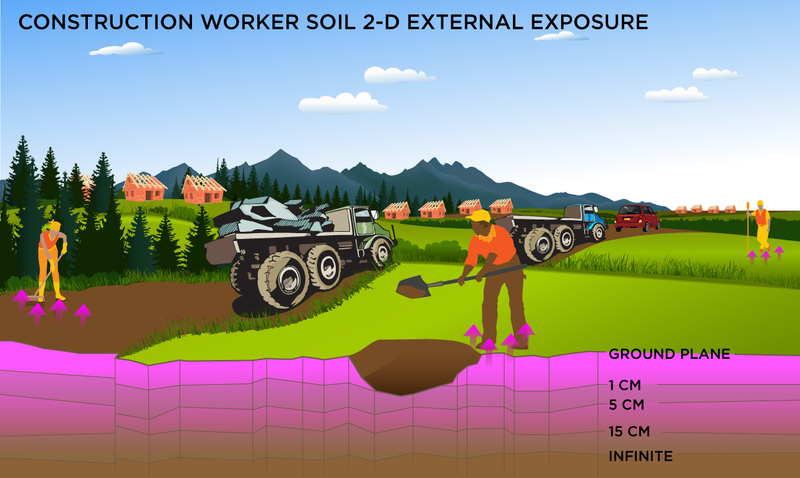 The outdoor worker soil land use is not provided in the Download Area but PRGs can be created by using the Calculator to modify the exposure parameters for the composite worker to match the equations that follow. This is a long-term receptor exposed during the work day who is a full time employee working on-site and who spends most of the workday conducting maintenance activities outdoors. The activities for this receptor (e.g., moderate digging, landscaping) typically involve on-site exposures to surface soils. 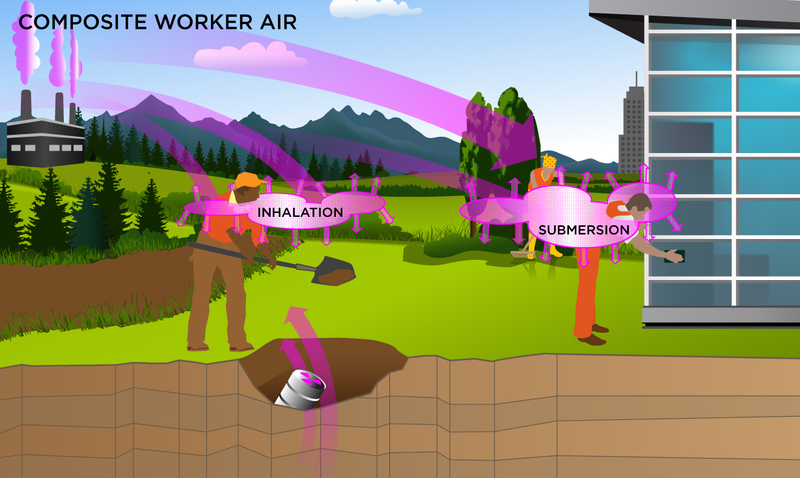 The outdoor worker is assumed to be exposed to contaminants via the following pathways: inhalation of ambient air and external radiation from contaminants in ambient air. This receptor spends most, if not all, of the workday indoors. 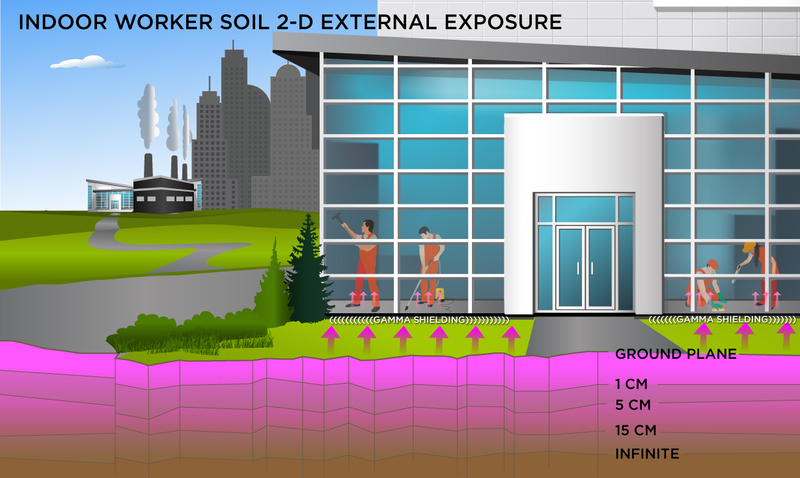 Thus, an indoor worker has no direct contact with outdoor soils. 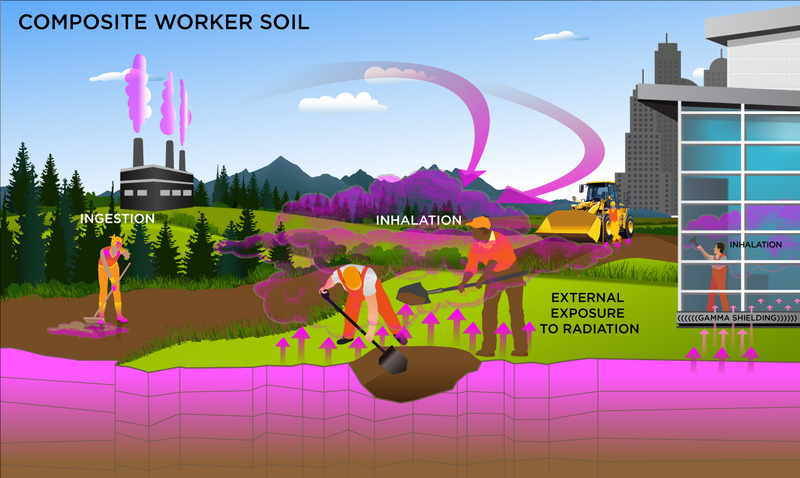 This worker may, however, be exposed to contaminants through ingestion of contaminated soils that have been incorporated into indoor dust, external radiation from contaminants in soil, and the inhalation of contaminants present in indoor air. PRGs calculated for this receptor are expected to be protective of both workers engaged in low intensity activities such as office work and those engaged in more strenuous activity (e.g., factory or warehouse workers). 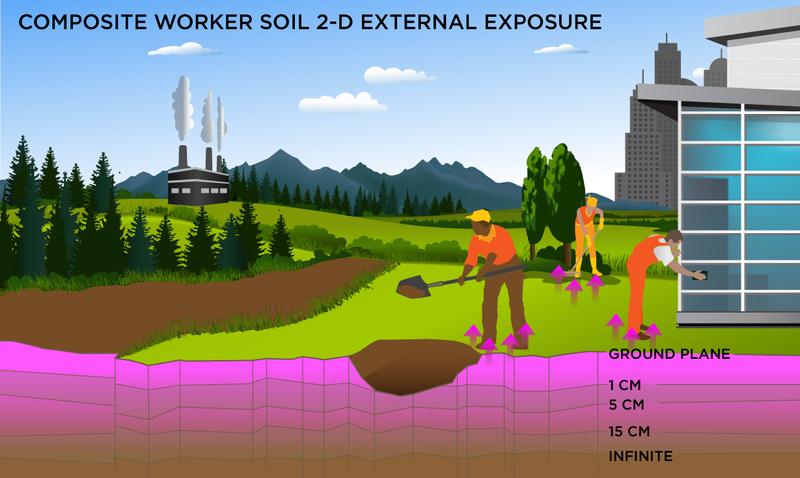 The indoor worker soil land use is not provided in the Download Area but PRGs can be created by using the Calculator to modify the exposure parameters for the composite worker to match the equations that follow. This receptor spends most, if not all, of the workday indoors. 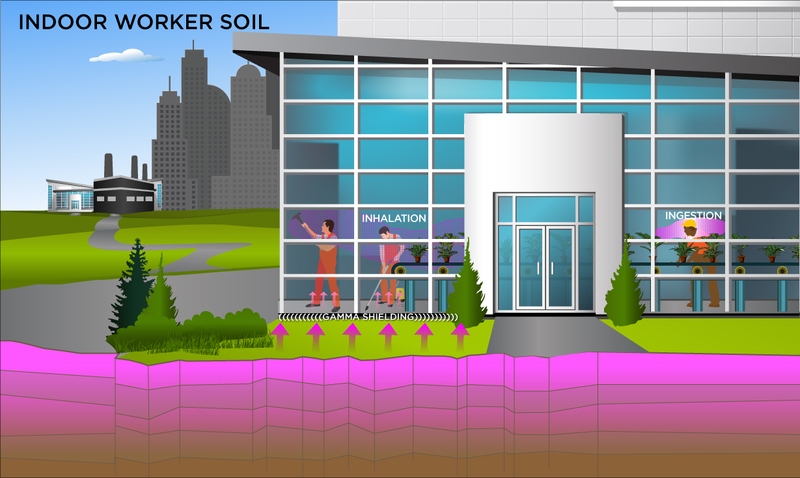 Thus, an indoor worker has no direct contact with outdoor soils. A gamma shielding factor is applied for this scenario to account for shielding provided by floors and foundation slabs. This is a long-term receptor exposed during the work day who is a full time employee working on-site who spends most, if not all, of the workday indoors. 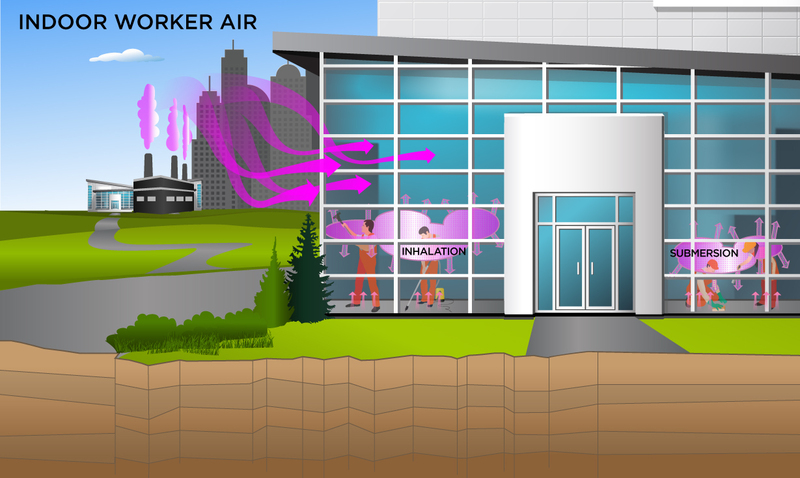 The indoor worker is assumed to be exposed to contaminants via the following pathways: inhalation of ambient air and external radiation from contaminants in ambient air. This is a short-term receptor exposed during the work day working around vehicles suspending dust in the air. The activities for this receptor (e.g., trenching, excavating) typically involve on-site exposures to surface soils. The construction worker is expected to have an elevated soil ingestion rate (330 mg per day) and is assumed to be exposed to contaminants via the following pathways: incidental ingestion of soil, external radiation from contaminants in soil, inhalation of fugitive dust. The only difference between this construction worker and the one described in section 4.12 is that this construction worker uses a different PEF. The construction worker soil land use is not provided in the Generic Tables but PRGs can be created by using the Calculator. The construction land use is described in the supplemental soil screening guidance. This land use is limited to an exposure duration of 1 year and is thus, subchronic. Other unique aspects of this scenario are that the PEF is based on mechanical disturbance of the soil. Two types of mechanical soil disturbance are addressed: standard vehicle traffic and other than standard vehicle traffic (e.g. wind, grading, dozing, tilling and excavating). In general, the intakes and contact rates are all greater than the outdoor worker. Exhibit 5-1 in the supplemental soil screening guidance presents the exposure parameters. This is a short-term receptor exposed during the work day who is a full time employee working on-site and who spends most of the workday conducting maintenance activities outdoors. The activities for this receptor (e.g., trenching, excavating, wind, grading, dozing, and tilling) typically involve on-site exposures to surface soils. This is a short-term receptor exposed during the work day during heavy construction activities outdoors. 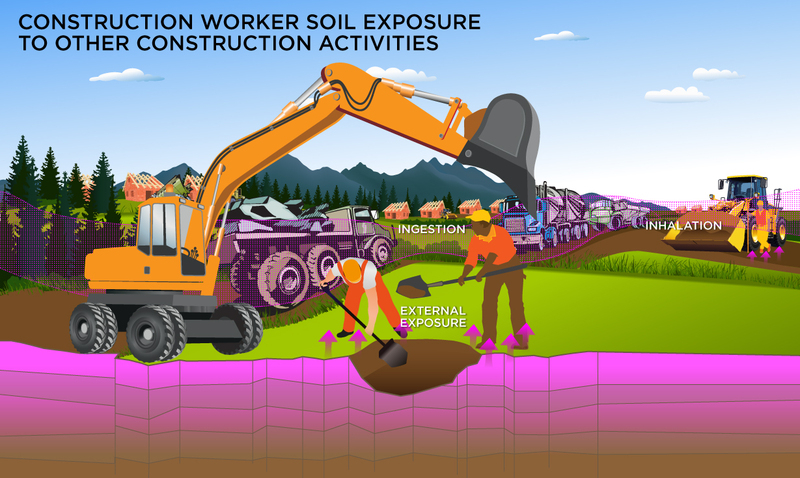 The activities for this receptor (e.g., trenching, excavating, wind, grading, dozing, and tilling) typically involve on-site exposures to surface soils. The construction worker is assumed to be exposed to contaminants via the following pathways: inhalation of ambient air and external radiation from contaminants in ambient air. This is a short-term receptor exposed during the work day working around heavy vehicles suspending dust in the air. The activities for this receptor (e.g., dozing, grading, tilling, dumping, excavating) typically involve on-site exposures to surface soils. The construction worker is expected to have an elevated soil ingestion rate (330 mg per day) and is assumed to be exposed to contaminants via the following pathways: incidental ingestion of soil, external radiation from contaminants in soil, inhalation of fugitive dust. The only difference between this construction worker and the one described in section 4.10 is that this construction worker uses a different PEF. This assessment is the same as Unpaved Roads. This receptor spends time outside involved in recreational activities. There are no default PRGs for this scenario; only site-specific. This receptor spends time involved in recreational activities. There are no default PRGs for this scenario; only site-specific. This receptor spends time involved in recreational hunting of waterfowl and land game. There are no default PRGs for this scenario; only site-specific. The transfer factor for fowl is the same transfer factor used for poultry. The transfer factor for game is the same transfer factor used for beef. 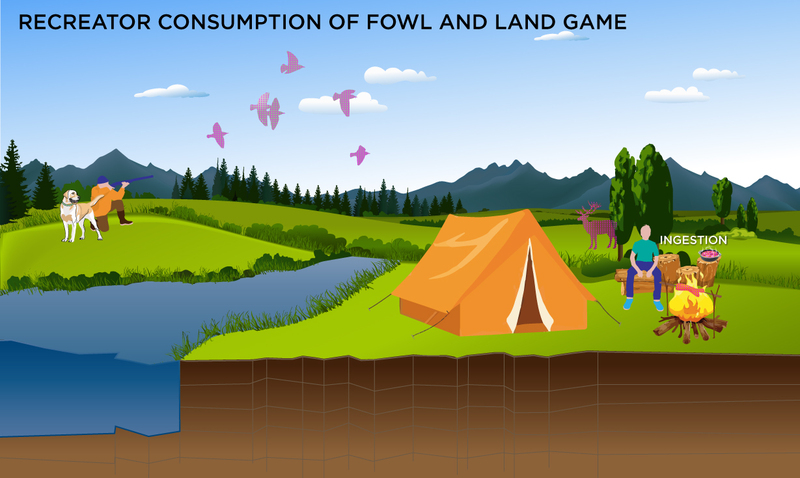 consumption of land game - back-calculated to water. This receptor is exposed to radionuclides that are present in surface water. Ingestion of water and immersion in water are appropriate pathways for all radionuclides. Inhalation is not considered due to mixing with outdoor air. There are no default PRGs for this scenario; only site-specific. The fish PRG represents the concentration, in the fish, that can be consumed. This is unlike the farmer scenario where the RPG is calculated for soil levels protective of fish consumption. Further the ingestion rate is not age adjusted like the farmer scenario. Note: the consumption rate for fish is not age adjusted for this land use. Also the PRG calculated for fish is not for soil, like for the farmer land uses, but is for fish tissue. Note: the consumption rate for fish is not age adjusted for this land use. Also the CDI calculated for fish is not for soil, like for the farmer land uses, but is for fish tissue. The farmer scenario should be considered an extension of the resident scenario and evaluate consumption of farm products for a subsistence farmer. Like the resident, the farmer assumes the receptor will be exposed via the consumption of home grown produce (100% of fruit and vegetables are from the farm). In addition to produce, 100% of consumption of the following are also considered to be from the farm: beef, milk, fish, swine, egg and poultry. All feed (100%) for farm products is considered to have been grown on contaminated portions of the site. For these farm products, risk-based PRGs are provided for the farm product itself (produce, beef, milk, etc.). Also like the resident, age-adjusted intake equations were developed for all of the consumption equations to account for changes in intake as the receptor ages. 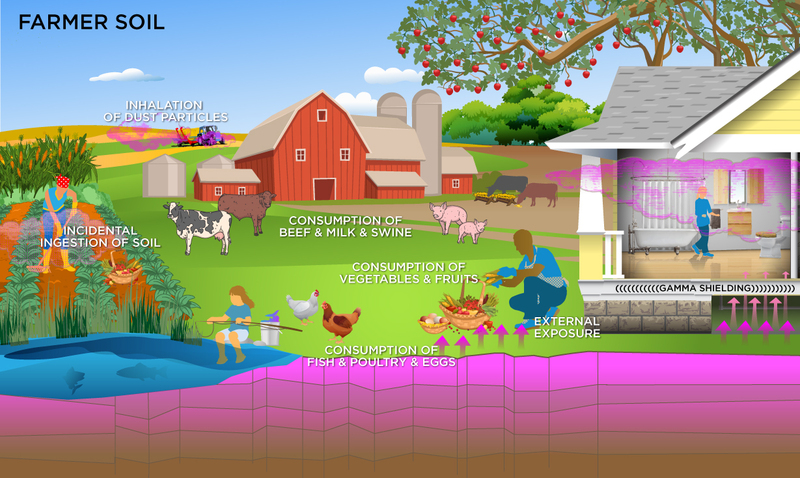 consumption of produce (fruits and vegetables). Sections 9 and 13 of the 2011 Exposure Factors Handbook were used to derive the intakes for home-grown produce. consumption of poultry. Table 13-52 of the 2011 Exposure Factors Handbook was used to derive the intakes for home-produced poultry. consumption of eggs. Table 13-40 of the 2011 Exposure Factors Handbook was used to derive the intakes for home-produced eggs. consumption of beef. Table 13-33 of the 2011 Exposure Factors Handbook was used to derive the intakes for home-produced beef. consumption of milk. Table 11-4 of the 2011 Exposure Factors Handbook was used to derive the intakes for home-produced total beef dairy. consumption of swine. Table 13-51 of the 2011 Exposure Factors Handbook was used to derive the intakes for home-produced swine. consumption of fish. Table 13-20 of the 2011 Exposure Factors Handbook was used to derive the intakes for home-caught fish. consumption of goat. There are no widely accepted human intakes for home-produced goat. consumption of goat milk. There are no widely accepted human intakes for home-produced goat dairy. consumption of sheep. There are no widely accepted human intakes for home-produced sheep. consumption of sheep milk. There are no widely accepted human intakes for home-produced sheep dairy. The farmer scenario should be considered an extension of the resident scenario and evaluate consumption of farm products for a subsistence farmer. 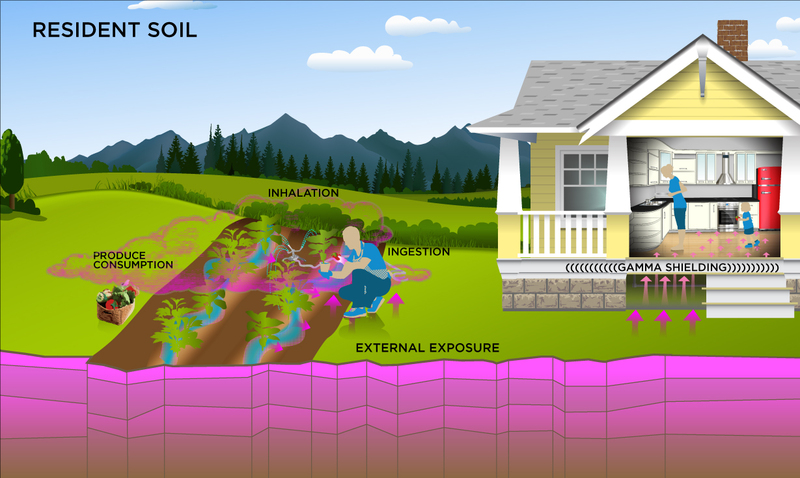 Like the resident, the farmer scenario assumes the receptor will be exposed via the following pathways: incidental ingestion of soil, external radiation from contaminants in soil, inhalation of fugitive dust and consumption of home grown produce (100% of fruit and vegetables are from the farm). In addition to produce, 100% of consumption of the following are also considered to be from the farm: beef, milk, fish, swine, egg and poultry. All feed (100%) for farm products is considered to have been grown on contaminated portions of the site. For these farm products, risk-based PRGs are provided for soil which may contribute contaminants to the products. Also like the resident, age-adjusted intake equations were developed for all of the ingestion/consumption equations to account for changes in intake as the receptor ages. 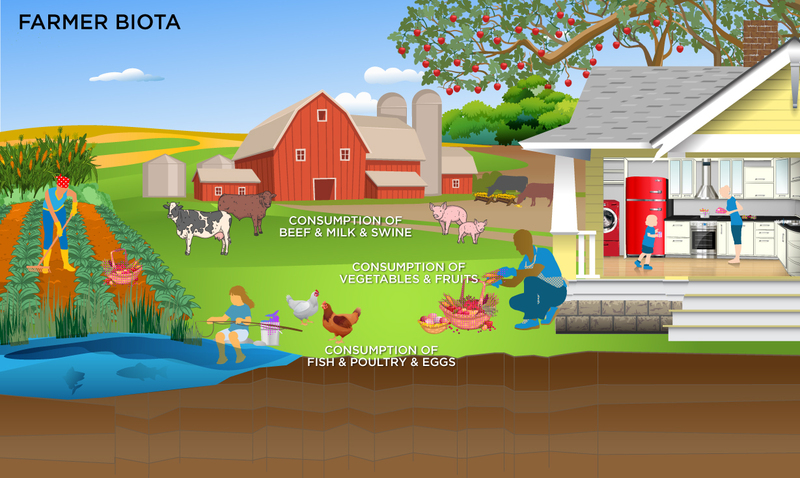 consumption of produce (fruits and vegetables). Sections 9 and 13 of the 2011 Exposure Factors Handbook were used to derive the intakes for home-grown produce. The following consumption routes are provided in site-specific mode only and requires the user to enter their own data as the tool only provides a transfer factor. consumption of goat. Please see table 1, in section 5 below, for sources of derived intakes for home-produced goat. consumption of goat milk. Please see table 1, in section 5 below, for sources of derived intakes for home-produced goat dairy. consumption of sheep. Please see table 1, in section 5 below, for sources of derived intakes for home-produced sheep. consumption of sheep milk. Please see table 1, in section 5 below, for sources of derived intakes for home-produced sheep dairy. The farmer scenario should be considered an extension of the resident scenario and evaluate consumption of farm products for a subsistence farmer. 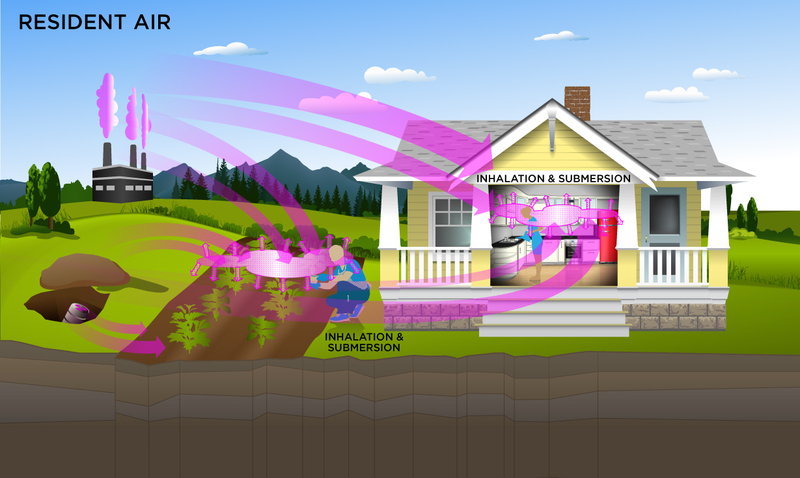 Like the resident, the farmer scenario assumes the receptor will be exposed via the following pathways: ingestion of tapwater, external radiation from contaminants in tapwater, inhalation of gases in tapwater and consumption of home grown produce (100% of fruit and vegetables are from the farm). The inhalation exposure route is only calculated for C-14, H-3, Ra-224, and Ra-226 which volatilize. In addition to produce, 100% of consumption of the following are also considered to be from the farm: beef, milk, fish, swine, egg and poultry. All water (100%) for farm products is considered to have been provided from contaminated portions of the site. For these farm products, risk-based PRGs are provided for the water which may contribute contaminants to the products. Also like the resident, age-adjusted intake equations were developed for all of the ingestion/consumption equations to account for changes in intake as the receptor ages. consumption of sheep milk. Please see table 1, in section 5 below, for sources of derived for home-produced sheep dairy. The farmer scenario should be considered an extension of the resident scenario and evaluate consumption of farm products for a subsistence farmer. 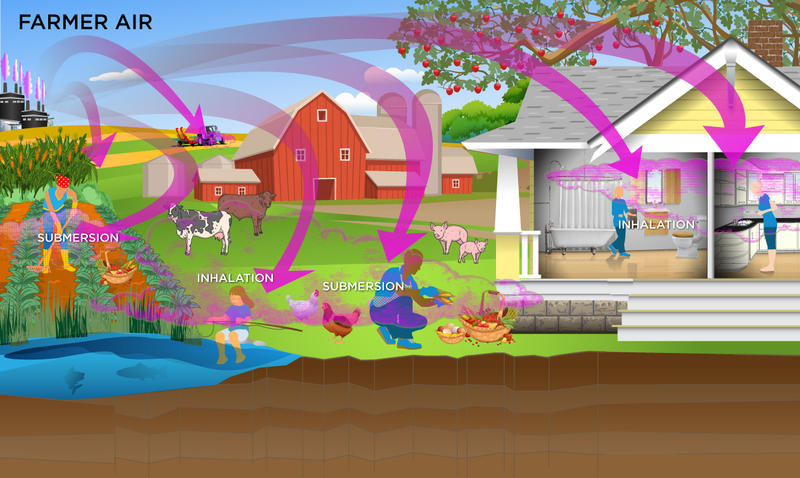 Like the resident, the farmer scenario assumes the receptor will be exposed via consumption of home grown produce (100% of fruit and vegetables are from the farm). In addition to produce, 100% of consumption of the following are also considered to be from the farm: beef, milk, fish, swine, egg and poultry. All feed and water (100%) for farm products is considered to have been grown on or provided from contaminated portions of the site. For these farm products, risk-based PRGs are provided for both soil and water which may contribute contaminants to the products. The results are presented in an interactive graphic that shows the contribution from both sources. See section 4.26.7 for details. Also like the resident, age-adjusted intake equations were developed for all of the ingestion/consumption equations to account for changes in intake as the receptor ages. Results of back-calculating exposure to soil and water are presented in an interactive graph. See Section 4.26.7 for details. This receptor spends most, if not all, of the day at home except for the hours spent at work. The activities for this receptor involve typical home making chores (cooking, cleaning and laundering) as well as gardening. The resident is assumed to be exposed to contaminants via the following pathways: inhalation of ambient air and external radiation from contaminants in ambient air. To take into account the different inhalation rates for children and adults, age adjusted intake equations were developed to account for changes in intake as the receptor ages. Two ambient air exposure conditions are offered for this scenario. The first scenario includes a half-life decay function and the second scenario does not. In situations where the contaminant in the air is not being replenished (e.g., an accidental one-time air release from a factory), equations for the first scenario should be used. In situations where the contaminant in the air has a continual source (e.g., indoor radon from radium in the soil, or an operating factory or landfill cap), equations for the second scenario should be used. The soil to groundwater scenario was developed to identify concentrations in soil that have the potential to contaminate groundwater above risk based PRGs or MCLs. Migration of contaminants from soil to groundwater can be envisioned as a two-stage process: (1) release of contaminant from soil to soil leachate and (2) transport of the contaminant through the underlying soil and aquifer to a receptor well. The soil to groundwater scenario considers both of these fate and transport mechanisms. First, the acceptable groundwater concentration is multiplied by a dilution factor to obtain a target leachate concentration. For example, if the dilution factor is 10 and the MCL is 0.05 mg/L, the target soil leachate concentration would be 0.5 mg/L. The partition equation (presented in the Soil Screening Guidance for Radionuclides documents) is then used to calculate the total soil concentration corresponding to this soil leachate concentration. The SSL methodology was designed for use during the early stages of a site evaluation when information about subsurface conditions may be limited. Because of this constraint, the methodology is based on protective, simplifying assumptions about the release and transport of contaminants in the subsurface. The method for calculating SSLs for the migration to groundwater pathway was developed to identify radionuclide concentrations in soil that have the potential to contaminate groundwater above screening levels (i.e., MCLs or risk-based concentrations (RBCs). Migration of radionuclides from soil to groundwater can be envisioned as a two-stage process: (1) release of contaminant in soil leachate and (2) transport of the contaminant through the underlying soil and aquifer to a receptor well. The SSL method considers both of these fate and transport mechanisms. SSLs are back-calculated from acceptable groundwater concentrations. First, the acceptable groundwater concentration is multiplied by a dilution factor to obtain a target leachate concentration. For example, if the dilution factor is 10 and the acceptable groundwater concentration is 10 pCi/L, the target soil leachate concentration would be 100 pCi/L. The partition equation is then used to calculate the total soil concentration (i.e., SSL) corresponding to this soil leachate concentration. The user has the option to choose from two calculation methods. The first method employs the default partitioning equation for migration to groundwater. The dilution factor defaults to 20 for a 0.5-acre source. If the user has all of the parameters needed to calculate a dilution factor, you may use the Method 2 (mass-limit equation for migration to groundwater). Then calculate the dilution factor using this equation. There are five parts of the above land use equations that require further explanation. The first is the explanation of the inhalation variable: the particulate emission factor (PEF). The second is the use of the radionuclide decay constant (λ). The third is the explanation of the area correction factor (ACF). The fourth is the explanation of the outdoor soil gamma shielding factor (GCFo). The fifth is explanation of the groundwater transport portion of the equations involving the soil to water partition coefficient (Kd). Inhalation of isotopes adsorbed to respirable particles (PM10) was assessed using a default PEF equal to 1.36 x 109 m3/kg. This equation relates the contaminant concentration in soil with the concentration of respirable particles in the air due to fugitive dust emissions from contaminated soils. The generic PEF was derived using default values that correspond to a receptor point concentration of approximately 0.76 ug/m3. The relationship is derived by Cowherd (1985) for a rapid assessment procedure applicable to a typical hazardous waste site, where the surface contamination provides a relatively continuous and constant potential for emission over an extended period of time (e.g. years). This represents an annual average emission rate based on wind erosion that should be compared with chronic health criteria; it is not appropriate for evaluating the potential for more acute exposures. Definitions of the input variables are in Table 1. With the exception of a few radionuclides, the PEF does not appear to significantly affect most PRGs. The equation forms the basis for deriving a generic PEF for the inhalation pathway. For more details regarding specific parameters used in the PEF model, refer to Soil Screening Guidance for Radionuclides: Technical Background Document. The use of alternate values on a specific site should be justified and presented in an Administrative Record if considered in CERCLA remedy selection. Note: the generic PEF evaluates wind-borne emissions and does not consider dust emissions from traffic or other forms of mechanical disturbance that could lead to greater emissions than assumed here. EPA believes that this value is appropriate for the average case, both outdoors and indoors. However, site managers can derive a site-specific VF term for tritium that may be more appropriate for a specific site, considering local atmospheric humidity and soil moisture content. The equation to calculate the subchronic particulate emission factor (PEFsc) is significantly different from the resident and non-resident PEF equations. The PEFsc focuses exclusively on emissions from truck traffic on unpaved roads, which typically contribute the majority of dust emissions during construction. This equation requires estimates of parameters such as the number of days with at least 0.01 inches of rainfall, the mean vehicle weight, and the sum of fleet vehicle distance traveled during construction. 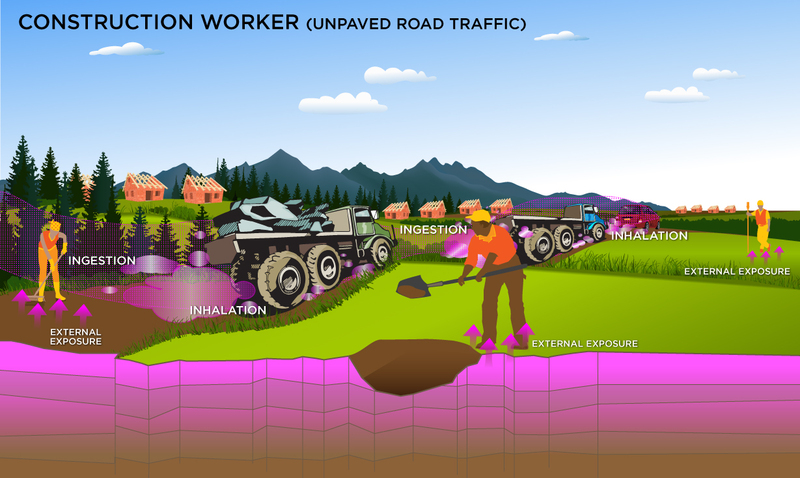 Other than emissions from unpaved road traffic, the construction worker may also be exposed to particulate matter emissions from wind erosion, excavation soil dumping, dozing, grading, and tilling or similar operations PEF'sc. These operations may occur separately or concurrently and the duration of each operation may be different. For these reasons, the total unit mass emitted from each operation is calculated separately and the sum is normalized over the entire area of contamination and over the entire time during which construction activities take place. Equation E-26 in the supplemental soil screening guidance was used. The decay constant term (λ), which is based on the half-life of the isotope, is used for some media in nearly all land uses. λ = 0.693/half-life in years (where, 0.693=ln(2)). The term (1 - e-λt) takes into account the number of half-lives that will occur within the exposure duration to calculate an appropriate value. For the secular equilibrium PRG output option, decay is not used. In most cases, site-specific analytical data should be used to establish the actual degree of equilibrium between each parent radionuclide and its decay products in each media sampled. However, in the absence of empirical data, the secular equilibrium PRGs will provide a protective screening value. Definitions of the input variables are in Table 1. To accommodate the fact that in most residential settings the assumption of an infinite slab source will result in overly protective PRGs, an adjustment for source area is considered to be an important modification to the RAGS/HHEM Part B model. Thus, an area correction factor, ACF, has been added to the calculation of recommended PRGs. For the 2-D exposure models addressing finite areas, the ACF is made variable by isotope and area for site-specific analysis. In addition, ACFs are now available for all alternate soil analysis source depths (ground plane, 1 cm, 5 cm and 15 cm source volumes as well as infinite source volume). This calculator allows the user to select from 19 different soil area sizes. If the default mode is selected, the ACF from the most protective area size is selected. If site-specific mode is selected, the user must select the source area. For further information on the derivation of the isotope-specific/area-specific ACF values for 2-D areas see the Center for Radiation Protection Knowledge ACF report and appendix containing +D and +E values. For the calculation of area correction factors, a standard soil density of 1.6 g/cm3 has been used. For a description of other EPA default ACF values that predate this guidance, follow the link here. PRGs in this guidance are calculated without any shielding between the receptor and the source (soil). In this case, a default soil gamma shielding factor for outdoor exposure to ionizing radiation (GSFo is established at 1.0 (0% shielding). It is common to have some shielding (soil cover) over contaminated soil. When the calculator is ran in site-specific mode the user must select a soil cover depth. Due to shielding, covering the contaminated area with soil will produce lower dose and risk coefficients than are stated in the Federal Guidance Report (FGR) 12 and 13. Therefore, gamma shielding factors are needed to apply the published EPA risk values to the buried contamination scenarios. Outdoor gamma shielding factors (GSFo) are derived by modeling various thicknesses of clean soil covering ground soil contamination. The gamma shielding factor is defined as the ratio of the dose corresponding to covered contamination to that of an unshielded surface source in soil. The MCNP output was used to derive kerma values one meter above the soil surface for various scenarios ranging from 0 cm soil cover to 100 cm soil cover in 10 cm increments while using source thicknesses of ground plane, 1, 5 and 15 cm source volumes as well as infinite source volume. Radioisotopes published in ICRP 107 were considered, along with decay chains of several radioisotopes. The Center for Radiation Protection Knowledge has provided GSFo values here and an appendix containing +D and +E values. Additional source depth-specific soil gamma shielding factors (GSF) are now given for cover depths of 2 to 10 meters. The values are presented in this appendix. A default gamma shielding factor for indoor exposure to ionizing radiation (GSFi) is established at 0.4 (60% shielding). 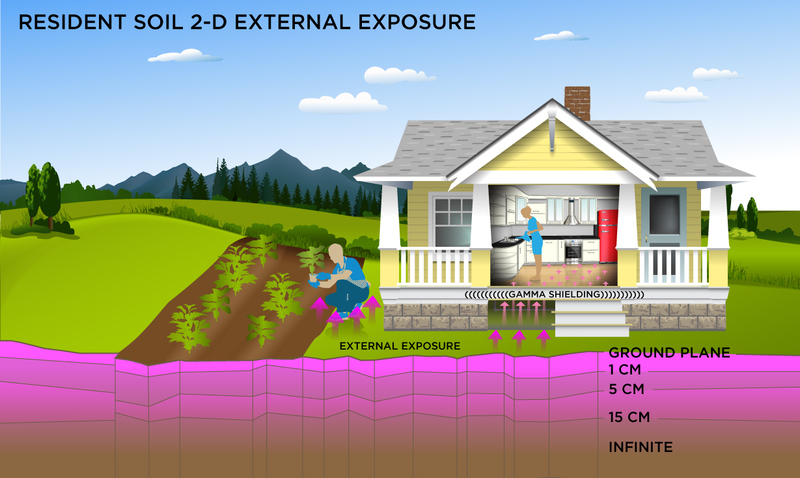 In the resident, farmer, and indoor worker soil external exposure equations GSFi-total is applied to account for the gamma sheilding provided by clean soil cover and the building subfloor. GSFi-total = GSFi × GSFb; this is the product of the gamma shielding provided by the soil cover under the building (GSFb) and the subfloor of the building (GSFi). This accounts for all the gamma shielding during the exposure time of a resident while indoors. A default gamma shielding factor for exposure to ionizing radiation in air (GSFa) is established at 1 (0% shielding). For the calculation of gamma shielding factors, a standard soil density of 1.6 g/cm3 has been used. When multiple media are contributing to the overall site risk, it may be more practical to remediate one medium vs another. In the case of the farmer scenario, water and soil may both contribute to the risk from ingesting produce, milk, beef, swine, poultry, eggs, and fish. Sheep, sheep milk, goat, and goat milk will be available for selection in site-specific mode, provided the user is able to provide intake rate data for children and adults. The graph shows the PRGs for soil and water to achieve the target risk or target hazard index for the exposure route of concern. The back-calculated to soil and water PRG results are listed after back-calculated to soil and back-calculated to water on the results page. The graph is available for ingestion of produce and animal products and may be accessed by clicking on any highlighted blue PRG link in the image below. Clicking on a highlighted blue back-calculated to soil and water PRG will take the user to the Farmer PRG Graphical Results page where the graph is displayed. The x-intercept (x,0) shows where the water PRG = Target Risk (TR) and soil concentration must equal 0. The y-intercept (0,y) shows where the soil PRG = TR and the water concentration must equal 0. Any point between (x,0) and (0,y) shows a separate PRG for water and soil that will meet the TR. The slope between the water PRG and soil PRG is provided, if the user wishes to calculate another PRG that will meet the TR. The scale of the graph has been programmed with upper bounds of 1.0E+6 pCi/g and 1.0E+6 pCi/L and lower bounds of 1.0E-10 pCi/g and 1.0E-10 pCi/L solely for presentation purposes to avoid scaling issues. In situations where the contaminant in the soil or air is not being replenished, decay should be used. 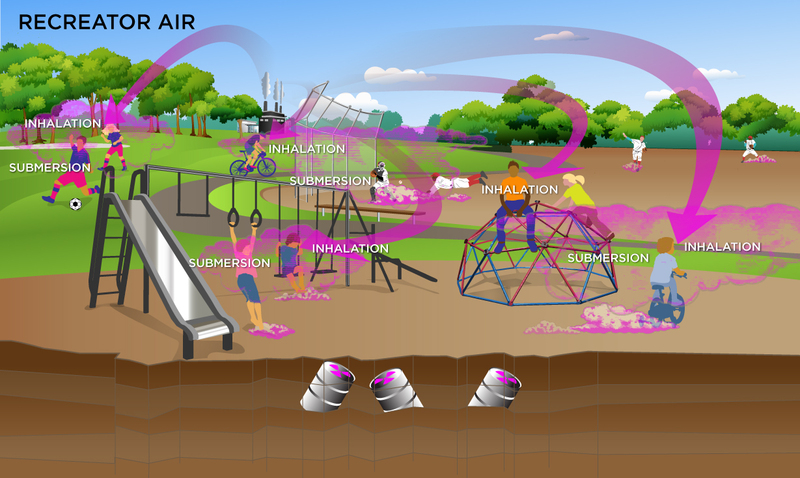 An air situation that would require decay, includes an accidental one-time air release from a factory. A soil situation that would require decay is a a one-time dump at a landfill. In situations where the contaminant in the soil or air has a continual source (e.g., indoor radon from radium in the soil, or an operating factory or landfill cap, uranium mining), the equations without decay should be used. The decay function, found in section 4.10.8, can be multiplied by the ambient air equations above to acquire ambient air PRGs with decay. Table 1 presents the definitions of the variables and their default values. The PRG default values and exposure models are consistent with the Dose Compliance Concentrations for Radionuclides (DCC) calculator. Both the PRG and DCC calculator default values are consistent with the Regional Screening Levels for Chemical Contaminants at Superfund Sites (RSL) calculator where the same pathways are addressed (e.g., ingestion and inhalation) and are analogous where pathways are similar (e.g., dermal and external exposure). This calculator, the DCC, and the RSL, all follow the recommendations in the OSWER Directive concerning use of exposure parameters from the 2011 Exposure Factors Handbook. Any alternative values or assumptions used in remedy evaluation or selection on a CERCLA site should be presented with supporting rationale in Administrative Records. tres Time - resident (years) 26 U.S. EPA 2011a, Table 16-108; 90th percentile or current residence time. Qw-beef Beef Water Intake Rate (L/day) 53 U.S. EPA 1999a (pg 10-23). U.S. EPA 1997b. Qw-dairy Dairy Water Intake Rate (L/day) 92 U.S. EPA 1999a (pg 10-23). U.S. EPA 1997b. IFWres-adj Resident Tapwater Ingestion Rate - age-adjusted (L) 19,138 Calculated using the age-adjusted intake factors equation. IFWrec-adj Recreator Surface Water Ingestion Fraction - age-adjusted (L) site-specific Calculated using the age-adjusted intake factors equation. IFAres-adj Resident Inhalation Rate - age-adjusted (m3) 161,100 Calculated using the age-adjusted intake factors equation. IFAfar-adj Farmer Inhalation Fraction - age-adjusted (m3) 259,000 Calculated using the age-adjusted intake factors equation. IFArec-adj Recreator Inhalation Fraction - age-adjusted (m3) site-specific Calculated using the age-adjusted intake factors equation. IFSres-adj Resident Ingestion Fraction - age-adjusted (mg) 1,120,000 Calculated using the age-adjusted intake factors equation. IFSrec-adj Recreator Ingestion Fraction - age-adjusted (mg) site-specific Calculated using the age-adjusted intake factors equation. IFSfar-adj Farmer Soil Ingestion Fraction - age-adjusted (mg) 1,610,000 Calculated using the age-adjusted intake factors equation. EDres Resident Exposure Duration (years) 26 U.S. EPA 2011a, Table 16-108; 90th percentile or current residence time. EDrec Recreator Exposure Duration (years) site-specific U.S. EPA 2011a, Table 16-108; 90th percentile or current residence time. AMEC (2014). Uptake of Gaseous Carbon-14 in the Biosphere: Development of an Assessment Model. AMEC/004041/007, Issue 2. Calabrese E.J., Barnes R., Stanek III E.J., Pastides H., Gilbert CE, Veneman P., Wang XR, Lasztity A., and Kostecki P.T. (1989); How much soil do young children ingest: an epidemiologic study. Regul Toxicol Pharmacol: 10(2):123-137. Davis, S; Waller, P; Buschbom, R; Ballou, J; White, P. (1990). Quantitative estimates of soil ingestion in normal children between the ages of 2 and 7 years: Population-based estimates using aluminum, silicon, and titanium as soil tracer elements. Arch Environ Health 45: 112-122. Environment Agency (E.A.) (2006). Initial radiological assessment methodology - part 2 methods and input data. United Kingdom. SC030162/SR2. Environment Agency (E.A.) (2009). Updated technical background to the CLEA model. United Kingdom. SC050021/SR3. pg. 97 and pg. 100. Etnier 1980. Till, J. E., H. R. Meyer, E. L. Etnier, E. S. Bomar, R. D. Gentry, G. G. Killough, P. S. Rohwer, V. J. Tennery, and C. C. Travis Tritium-An Analysis of Key Environmental and Dosimetric Questions. ORNL/TM-6990. pg 15. Hoffman, David J.; Rattner, Barnett A.; Burton, G. Allen jr.; Cairns, John jr. 2003. Handbook of Ecotoxicology: Second Edition. Lewis Publishers. IAEA 2009. Quantification of Radionuclide Transfer in Terrestrial and Freshwater Environments for Radiological Assessments. International Atomic Energy Agency. TECDOC1616. ICRP 2008. 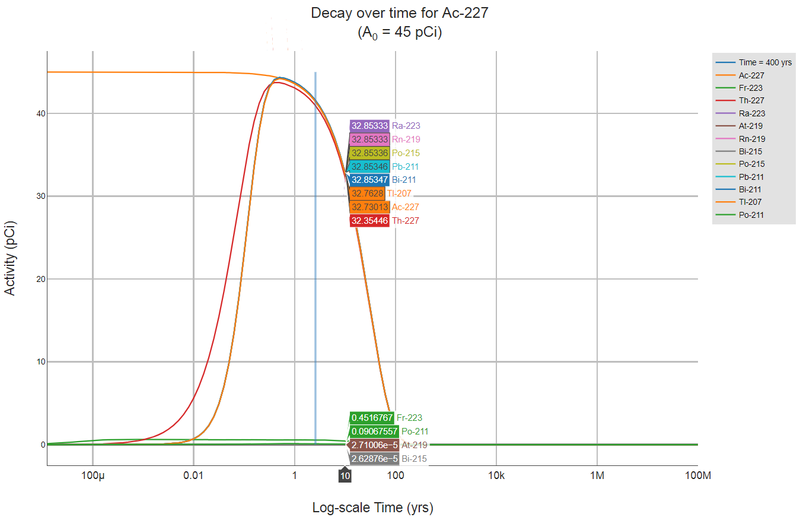 Nuclear Decay Data for Dosimetric Calculations. ICRP Publication 107. Ann. ICRP 38 (3). Lyons, Robert K.; Machen, Rick; Forbes, T.D.A. 1999 Understanding Forage Intake in Range Animals AgriLIFE Extension. Texas A&M. MILLER Ch. W. (1980): An analysis of measured values for the fraction of a radiocative aerosol intercepted by vegetation. Health Physics, 38: 705 - 712. NEC. Swine Nutrition Guide. Cooperative Extension Service / South Dakota State University and University of Nebraska / U.S. Department of Agriculture. Nebraska Cooperative Extension EC 95-273-C. The pig water ingestion numbers are derived from the USDA "Swine Nutrition Guide" and the EPA Human Health Risk Assessment Protocol for Hazardous Waste Combustion Facilities, found here. USDA assumes a pig consumes 1/4 to 1/3 gallons of water for every pound of dry feed. The midpoint of this range (7/24 gallons of water per 1 lbs. of dry feed) was used with the default dry feed, (4.7 kg) from the U.S. EPA, to come up with 3 gallons (11.4 L) per day default water intake. NRC 1994. Nutrient Requirements of Poultry: Ninth Revised Edition. Washington, DC: The National Academies Press, 1994. OMAFRA (2015). Water Requirements of Livestock. Order Number 07-023. July, 2015. ORNL (2014a). Area Correction Factors for Contaminated Soil for Use in Risk and Dose Assessment Models and appendix. Center for Radiation Protection Knowledge. September 2014. ORNL (2014b). Gamma Shielding Factors for Soil Covered Contamination for Use in Risk and Dose Assessment Models and appendix. Center for Radiation Protection Knowledge. September 2014. ORNL (2014c). Calculation of Slope Factors and Dose Coefficients and appendix. Center for Radiation Protection Knowledge. September 2014. ORNL (2016). Biota Modeling in EPA's Preliminary Remediation Goal and Dose Compliance Concentration Calculators for Use in EPA Superfund Risk Assessment: Explanation of Intake Rate Derivation, Transfer Factor Compilation, and Mass Loading Factor Sources Center for Radiation Protection Knowledge. November 2016. Pinder, J. E. ,. I., and K. W. McLeod. (1989). Mass loading of soil particles on plant surfaces, Health Phys. 57:935-942. Tarr, Brian. Guidelines to Feeding and Management of Dairy Goats Nutrifax. Shur Gain. U.S. EPA (1989). U.S. Environmental Protection Agency (U.S. EPA). Risk assessment guidance for Superfund. Volume I: Human health evaluation manual (Part A). Interim Final. Office of Emergency and Remedial Response. EPA/540/1-89/002. U.S. EPA (1990). Interim Final Methodology for Assessing Health Risks Associated with Indirect Exposure to Combustor Emissions. Environmental Criteria and Assessment Office. ORD. EPA-600-90-003. January. U.S. EPA (1991a). U.S. Environmental Protection Agency (U.S. EPA). Human health evaluation manual, supplemental guidance: "Standard default exposure factors". OSWER Directive 9285.6-03. U.S. EPA (1994b). Radiation Site Cleanup Regulations: Technical Support Documents for the Development of Radiation Cleanup Levels for Soil - Review Draft. Office of Radiation and Indoor Air, Washington, DC. EPA 402-R-96-011A. PDF document View Appendix C here. U.S. EPA. (1997a). Exposure Factors Handbook. Office of Research and Development, Washington, DC. EPA/600/P-95/002Fa. U.S. EPA. (1997b). Parameter Guidance Document. National Center for Environmental Assessment, NCEA-0238. U.S. EPA. (1998). Human Health Risk Assessment Protocol for Hazardous Waste Combustion Facilities. Office of Solid Waste, Washington, DC. EPA530-D-98-001A. A secure PDF can be downloaded here. U.S. EPA. (1999a). Data Collection for the Hazardous Waste Identification Rule. Office of Solid Waste, Washington, DC. http://www.epa.gov/osw/hazard/wastetypes/wasteid/hwirwste/risk.htm The section on cattle fodder, soil and water intakes is here. U.S. EPA (2002). Simulating Transport in the Unsaturated Zone: Evaluation and Sensitivity Analyses of Select Computer Models. U.S. EPA. (2005). Human Health Risk Assessment Protocol for Hazardous Waste Combustion Facilities. Office of Solid Waste, Washington, DC. http://www.epa.gov/osw/hazard/tsd/td/combust/risk.htm. The pdf is available here. U.S. EPA. (2011). Exposure Factors Handbook 2011 Edition (Final). National Center for Environmental Assessment, Office of Research and Development. Washington D.C.
van Wijnen J.H., Clausing P., and Brunekreef B. 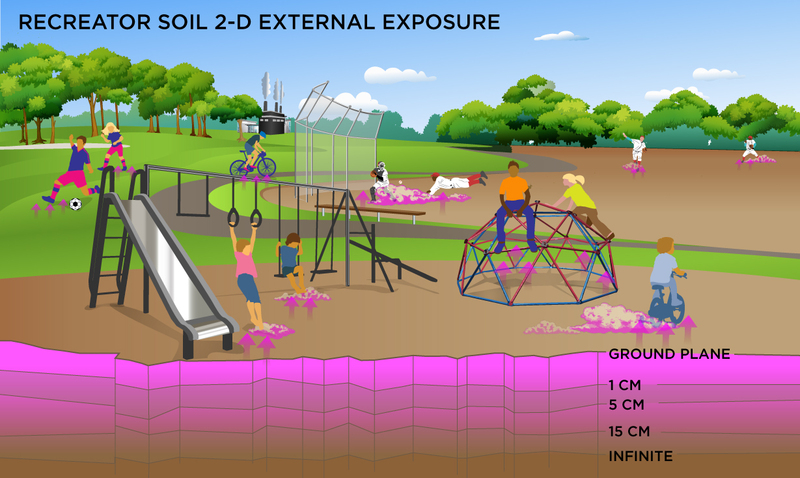 (1990); Estimated soil ingestion by children. Environ Res: 51(2): 147-162.